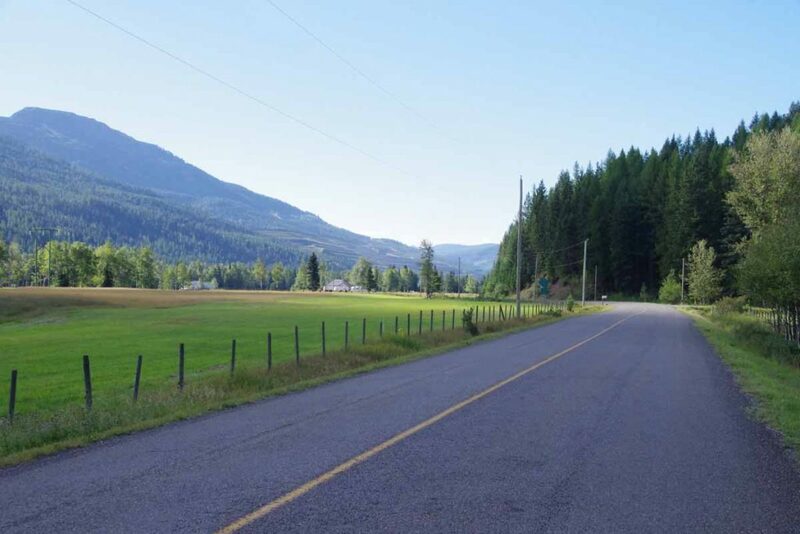 Easy ride today as I mostly followed the major roads from Elkford to Fernie. Approximately 75% of my miles today were on GDMBR, initially on the primary route and later on the “Fernie Alternative”. 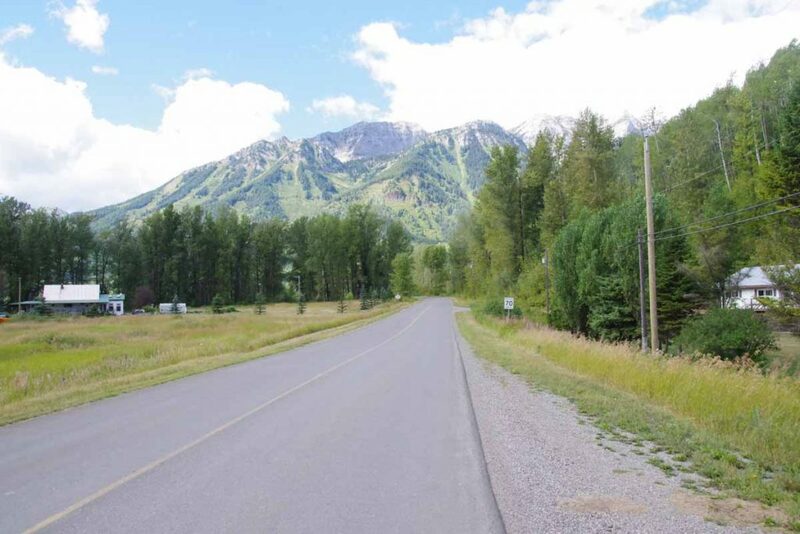 My guidebook describes the Fernie Alternative as “The Alternate, which was the original and one-and-only route until 2010, is about 40 miles shorter than the new main route and much tamer. 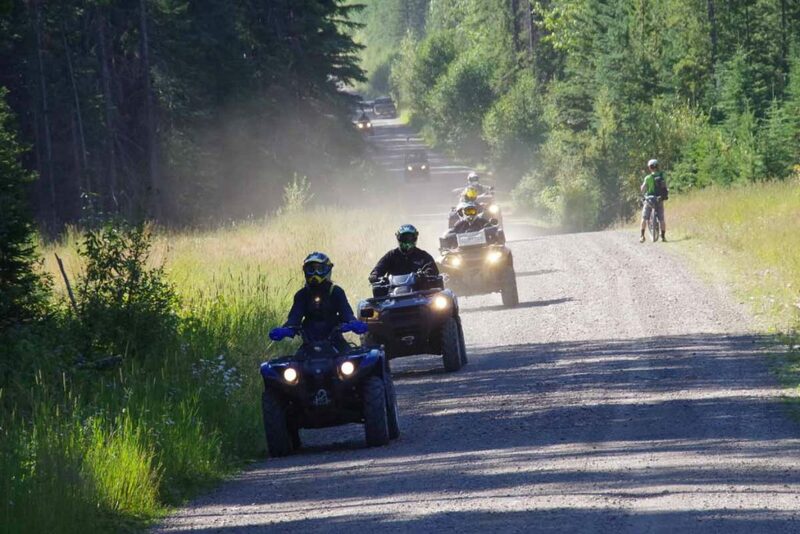 Riding the alternative is more like bicycle touring, while tackling the main route is akin to real mountain biking”. Seemed like a reasonable choice for me. 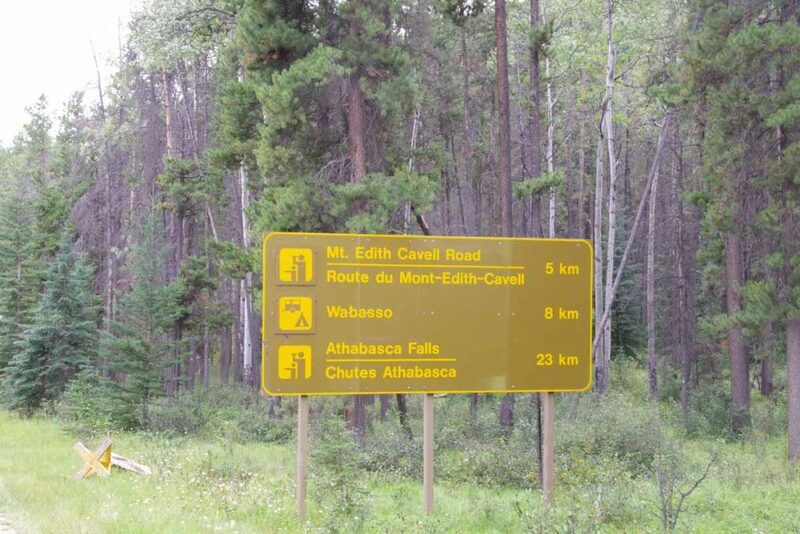 I took a short cut from Elkford, riding past the mining equipment above and then down the main highway. This met up with the original route after 10 miles, slicing off 8 miles from that route. It was a nice, fairly quite road with good shoulders. After another two miles, I followed the route on secondary road past the airport. 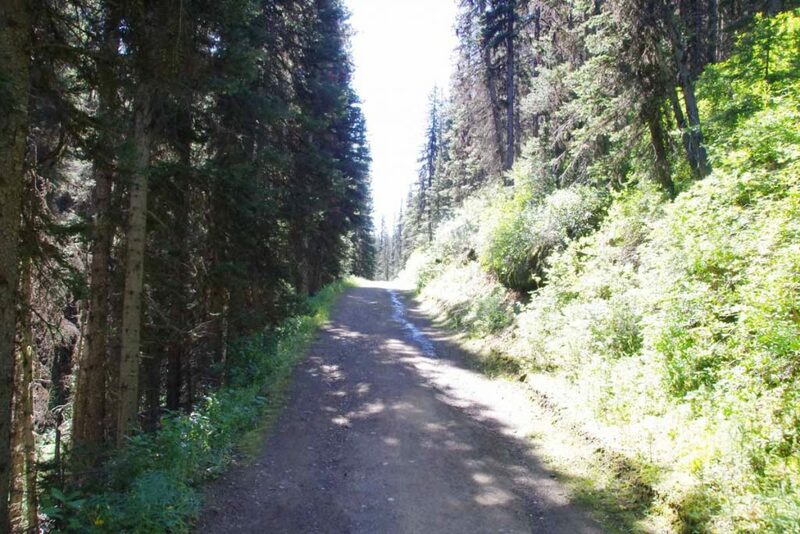 This was a quiet little back road that came past ranches and rural acreages. It was great riding. 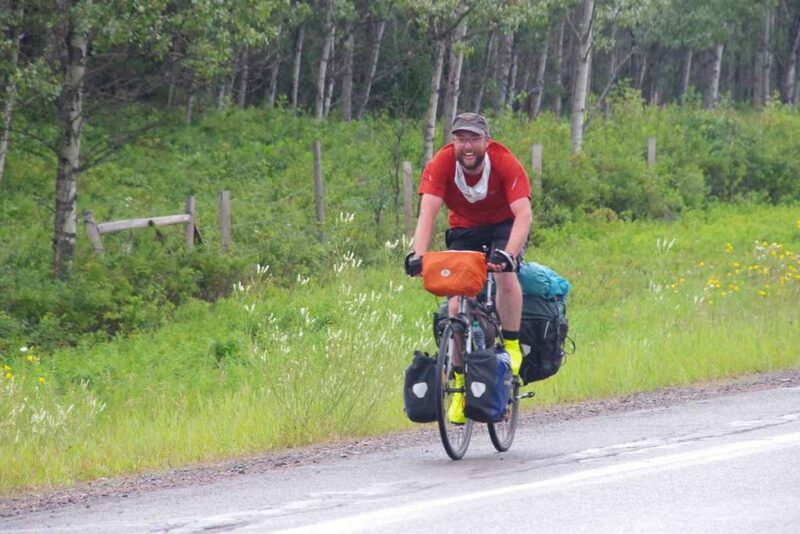 Before I knew it, had reached 22 mile mark and was in Sparwood. 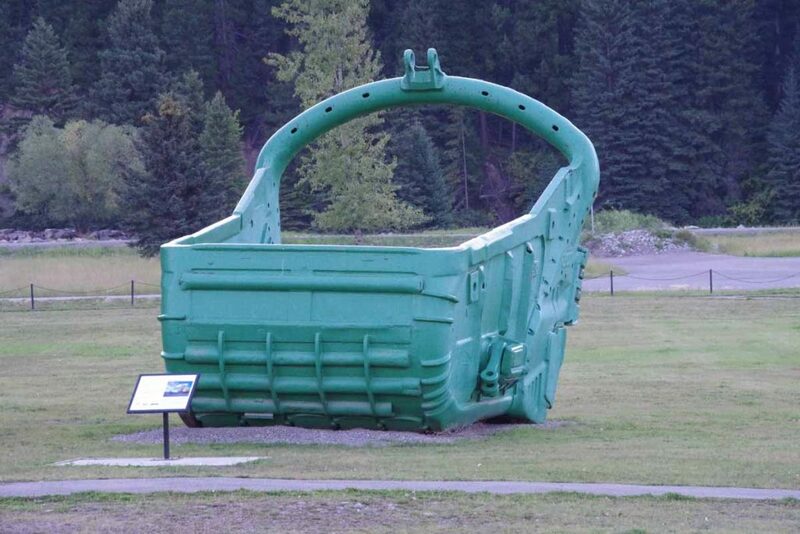 Sparwood is a mining town. 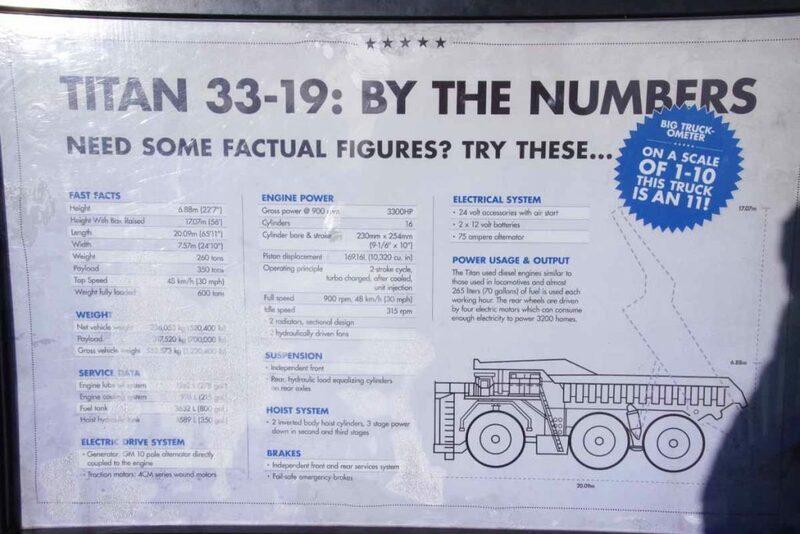 Below are two photos of the giant truck found near the visitor center. I dallied here for a bit and got an early lunch. In the meantime, the SSW winds (headwinds) picked up and were now perhaps 30km/h (20 mph). Route three out of town was busier but fortunately also had reasonable shoulders. Part way along was a second of road construction where they were paving the new route. Cars were held up for 20-30 minutes but I cycled up along the queue and not long after I came to front, we could go. After that there were multiple miles of grooved pavement. Fortunately, another quiet little road to travel along before reaching Fernie. Stopped in visitor center and also at shops on way in. My shoes had been falling apart. 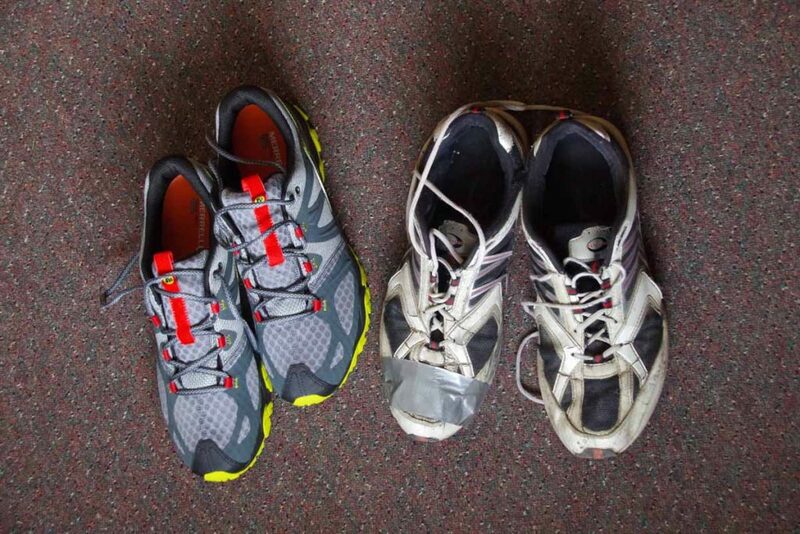 I could glue them together and attach with duct tape, but was time to buy new shoes. When I bought the shoes, the clerk remarked that it was “very Canadian” of me to have taped together the shoes. Not sure if that is a complement or not. Found motel at 42 miles near downtown Fernie. Overall, the winds were sometimes strong, but otherwise an easy day with mostly flat or slightly downhill as well as not too much distance. 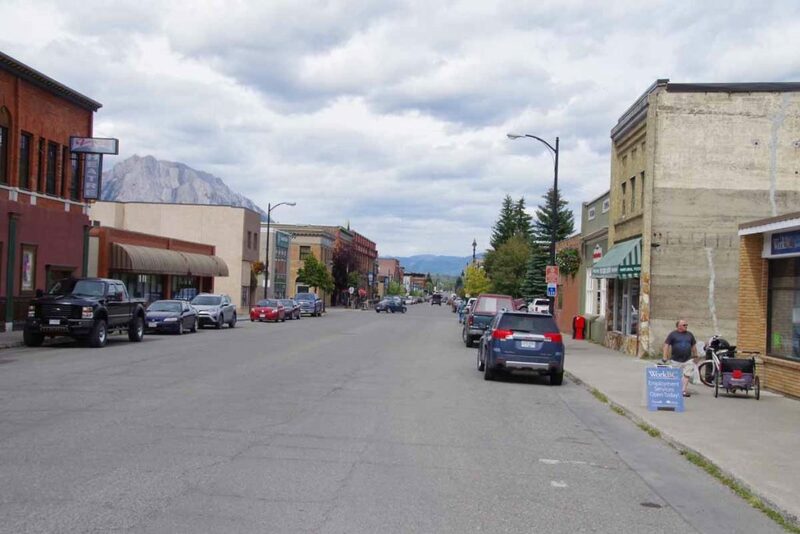 Fernie itself has a nice downtown. 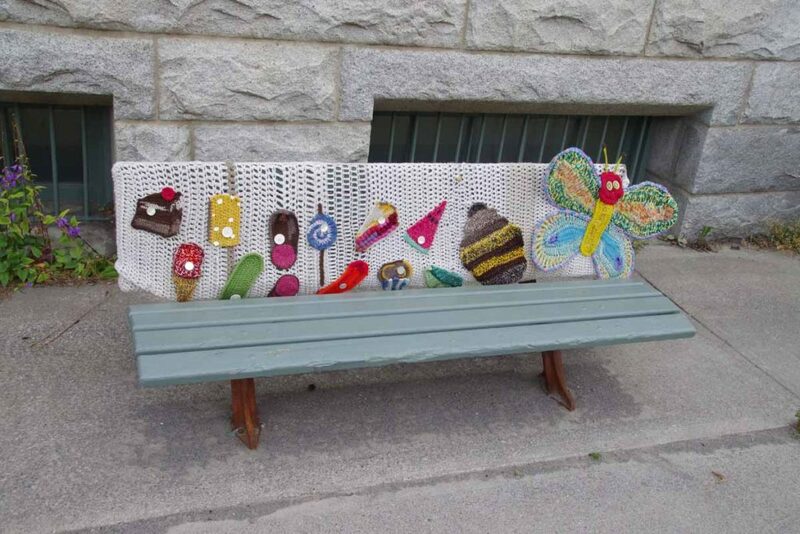 Where I also found someone had created crocheted bench covers near the library. Interesting idea. Tomorrow I’ll probably do a mostly “bike touring” day and ride along the major roads to reach the US border. 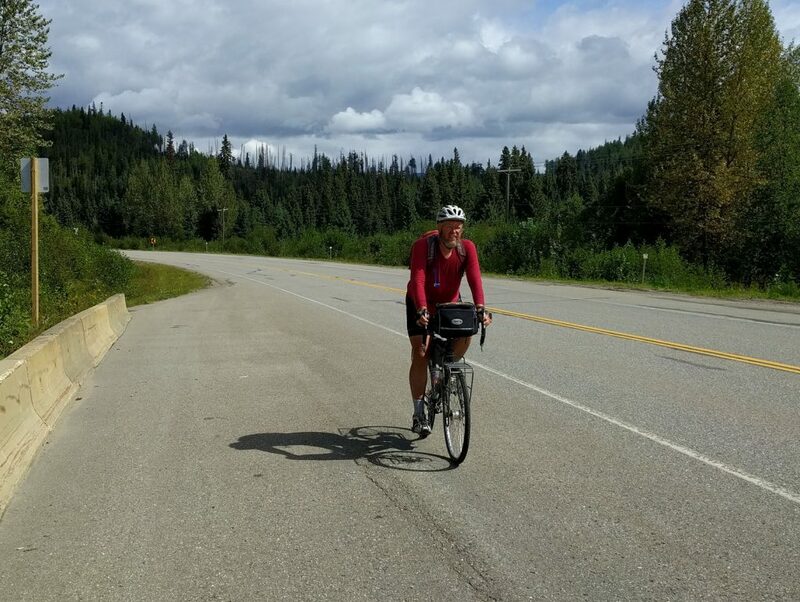 One tough day, one fun day and one easy day have brought me 110 miles further to Elkford, BC. It was a good introduction to the Great Divide Mountain Bike Route (GDMBR) and I can see that I’ll do a hybrid approach, riding GDMBR sometimes and paved roads other times. First day started with a lot of enthusiasm. I had breakfast in the hotel as was at the trailhead shortly after 8am. The temperature was cold, my cycle computer said -1C (30F) but I cycling hard made it feel less cold and it soon warmed up as well. I stopped at start of the Spray River trail and took first snap photo above. Wayne and Trish joined me for the first half of the day, which was fun. I left the trailhead ~45 minutes before they did, but they caught up even before I had finished the 11km of the Spray River Trail. It was somewhat flat, but even one or two slight hills to climb. Crossed a few bridges and then more climbing at Goat River Trail. It did seem like I was going surprisingly slow. I chalked that up to at least three things (a) overall there was more climbing than descent (b) I was just a bit slow on those uphills, carrying my gear (c) I switched over from km to miles. That last one definitely influenced my outlook since I was used to my cycle computer saying “40” or “50” by time I got to lunch and now it seemed much less. I had used km elsewhere in Canada since that was all the road signs, etc but now my GDMBR guide books and similar were all in miles. At 11.5 miles, we stayed on the trail rather than going to (dusty) Smith-Dorien Spray Road. Overall a better choice, though the trail had some climbing and I had to stop once or twice when my heel was kicking my right pannier into my spokes. Seemed like I was dragging a bit here. We made it ~17.5 miles together and then had lunch. Overall, definitely fun cycling with Wayne and Trish on this first bit to start. Also on East side was Smith-Dorien Spray road, the main road. Most likely the flattest route and a reasonable fallback if the new trail proved too difficult. The drawback here is a large amount of dust on the road. On the West side was the official route. It started on a small gravel road and then after a gate was trail on top of old road bed. In the end I decided to stay on official route. While it was a little longer, and wasn’t was interesting as the new trail – I figured I’d try keeping with current route first. 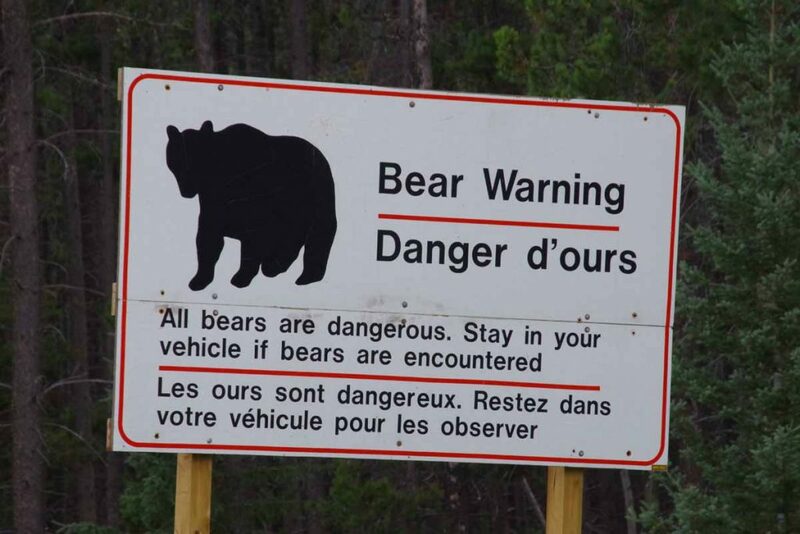 Several more warnings about bears here. After this a number of campground sites along the road. A little past 20 miles we had a gate and the road turned to trail. 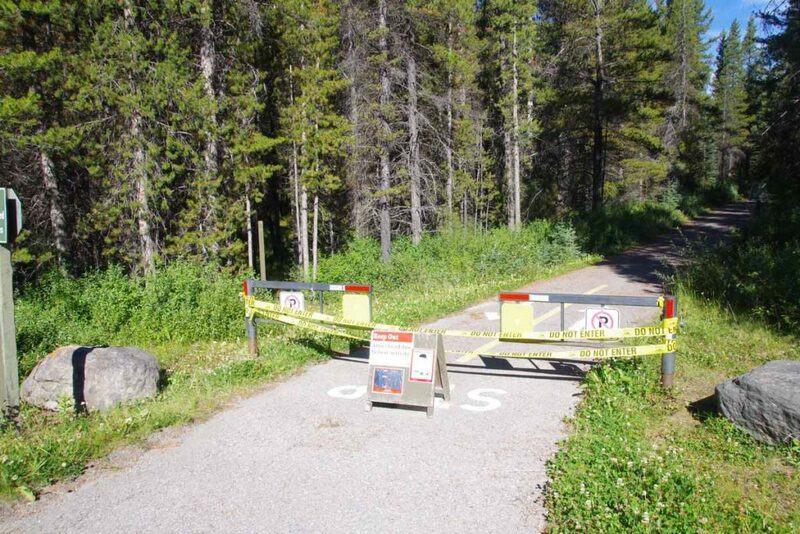 I have a “Cycling the Great Divide” guidebook which suggests stopping for the first day just past this gate and camping. Seemed to early and I pressed on. The next section was not too difficult trail riding slowly around the lake. I crossed the dam and then a bit more hiking around including a steep 0.75 miles where I pushed my bike up the hill. That brought me to a hiking/camping area named for Mount Shark. When I got to the parking lot I was tired, but figured the hardest was done. Little did I know the gravel road climbed from here. It climbed and then climbed a bit more. Finally it was almost 5pm when I got near to the top. I saw several “No Camping” signs and considered my options. There was a nice little stream nearby and I could see a spot where I could mostly duck behind the first row of trees. I decided to stop here. Only 38.4 miles but pretty tired for the day. I had a new water filter but it turned out defective so drank the water anyways. Overall the day was tougher than I expected. There was an overall climb of ~1600ft which probably helped and a fair amount of trail riding which is still somewhat new. I did think it was fortunate that I didn’t have a trailer since that would have made it even slower. 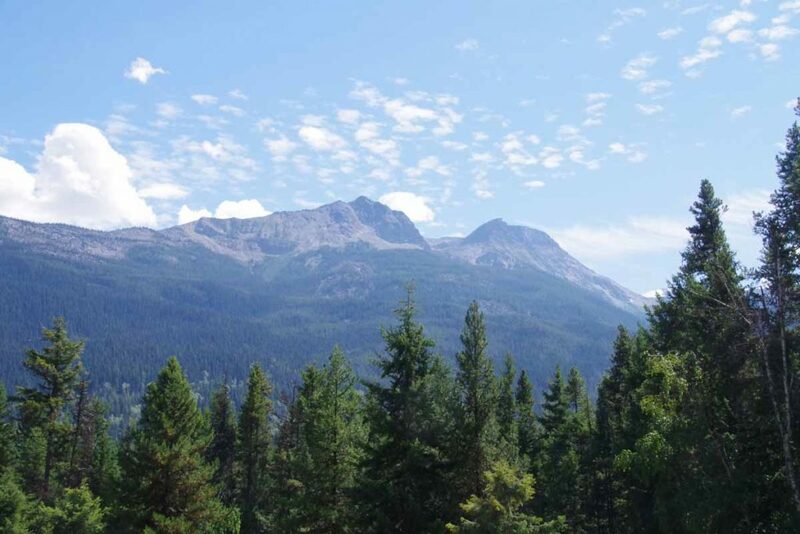 Today my primary goal was to climb over Elk Pass and camp somewhere on the British Columbia side. Early morning in my semi-hidden campsite before heading down the hill. It was again right at 0C (32F) but going down the hill I switched to new “lobster claw” mittens that put two pairs of fingers together. At bottom of the hill was Mount Engadine Lodge. 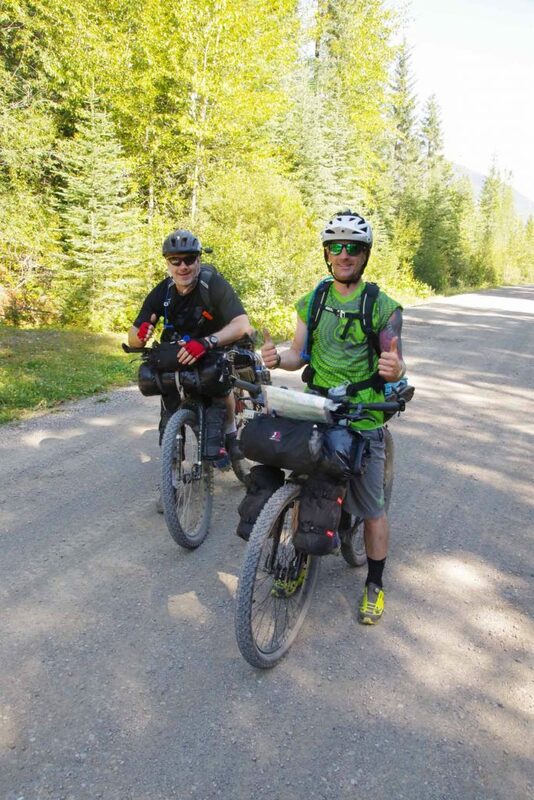 I saw two people packing up a tent, yelled out – they were also Great Divide riders who I would meet later. The main gravel road was faster than the trails from day before and miles accumulated a bit faster. 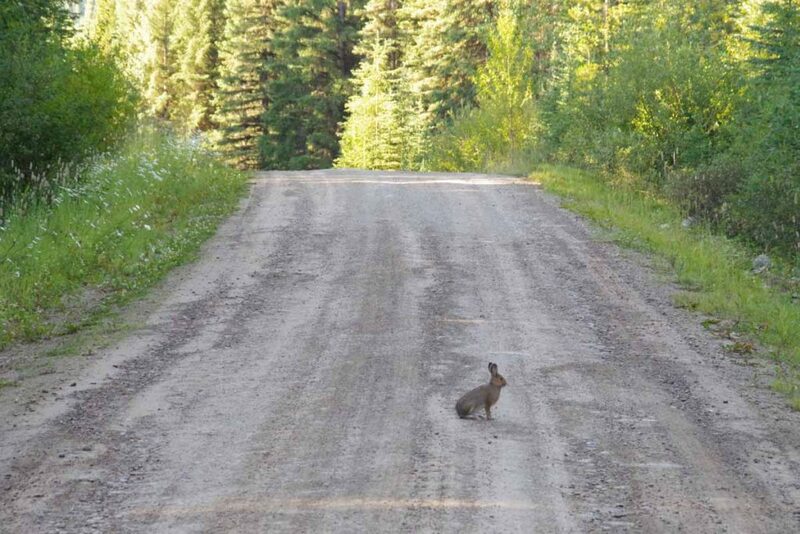 However, every time a car would go by it would kick up a bunch of dust which would take time to settle. There were a surprising number of cars and all except one were going in opposite direction. I passed several trailheads, picnic sites and a lot more “no camping” signs. At 17 miles I came to main road as well as pavement. Wow! That made some difference. After a mile a sign for paved bike path. However it was closed due to bear activity. 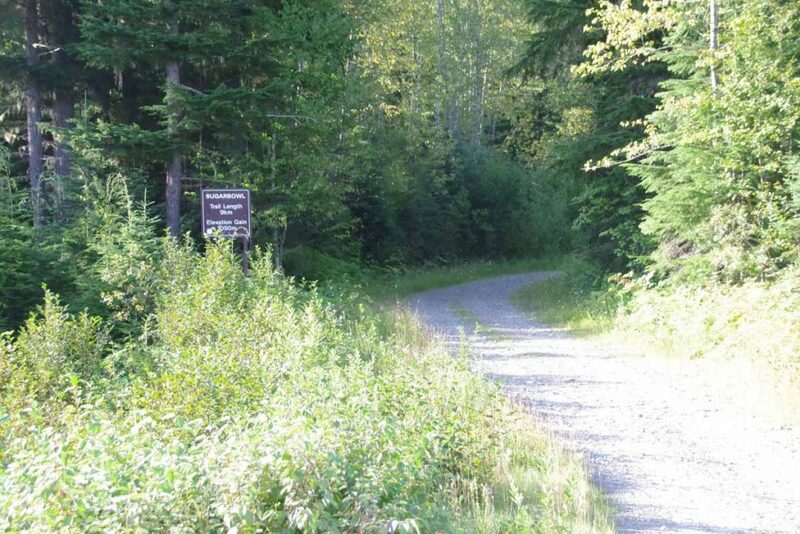 At 23 miles I came to Boulton Creek Trading Post. This was designated as a last chance to buy things before heading out again. I found some water purifying tablets and also decided to get some bear spray. Bear spray is classified as a firearm in Canada and I had to sign a short declaration with name and address. 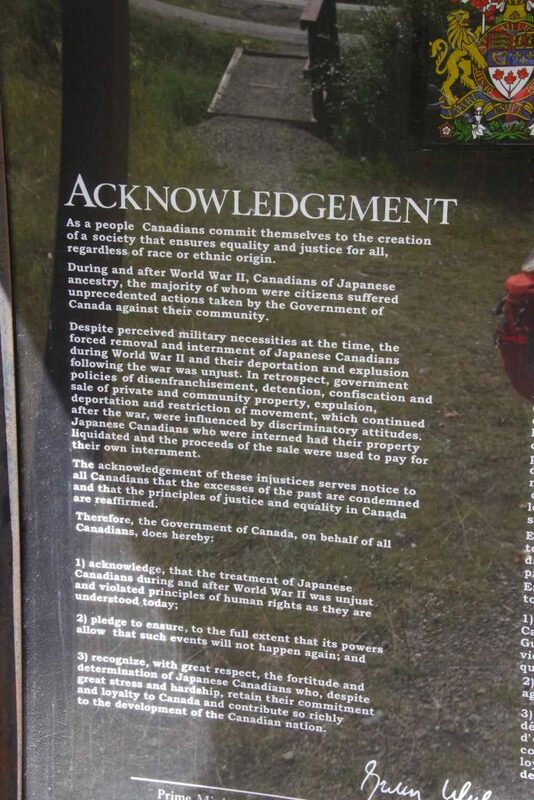 The declaration essentially indicated that my purpose in using the bear spray was for bears and not for people. One mile later was start of trailhead over Elk Pass. I decided to try an experiment this time. The entire distance over Elk Pass was only 3.5 miles uphill and 2.7 miles downhill or 6.2 miles (10km) total. Rather than bike it, I decided to hike it with my bike for the distance. That worked fairly well. On the uphill stretch my bike computer had one hill listed at 18% grade and on downhill one listed at 14% grade. Otherwise it wasn’t too difficult of a hike and a bit more relaxed. 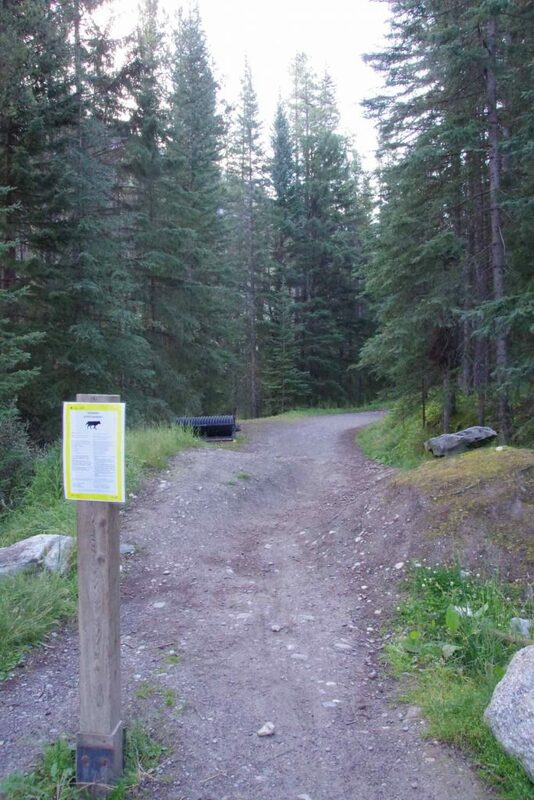 The top was marked with this gate and signs (looking back) to Peter Lougheed Provincial Park. This is first Atlantic/Pacific crossing on the GDMBR as well as first one on my trip so far. 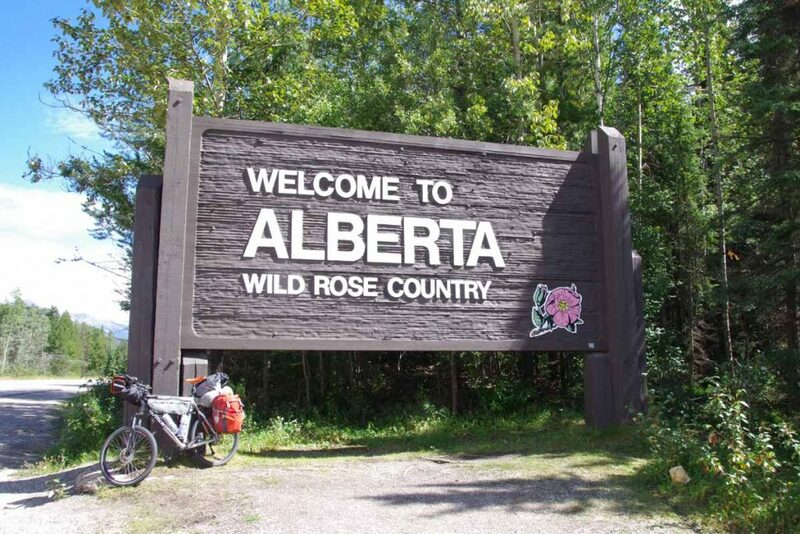 I’ve had other crossings so far but for example, I figured out that from McBride Yellowhead Pass was Pacific/Arctic and Sunwapta Pass was Arctic/Atlantic. At the trailhead was a gravel Elk River Road. I followed this for another 14 miles. The predominant direction was down, but there were also uphill pieces. The stones made the road rough at times but overall reasonable cycling. There were several “recreation sites” along the way including this one at Tobermory with a cabin. Approximately 10 miles after Tobermory I came to a small site named “Weary River” and finished the day at mile marker 81.6. Overall, found the second day fun and not quite as exhausting as the first. Walking the pass helped and overall terrain was probably a bit easier with not as much climbing. A little after I set up camp, two cycle tourists arrived. 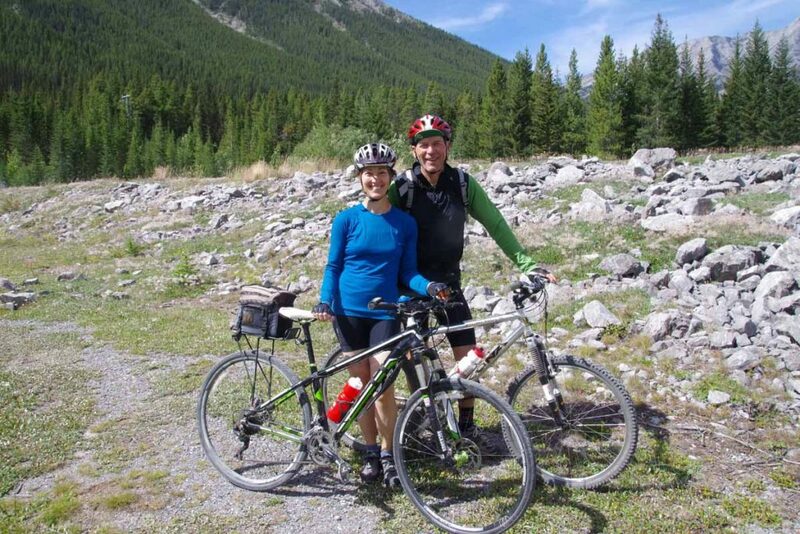 I had seen them this morning packing up from Mount Engadine as I cycled past in first mile. Both from Scotland and somewhat more aggressive timetable than myself and also traveling a bit faster. Unfortunately, they had received a ticket for camping the previous night. Today was easiest day of the three. 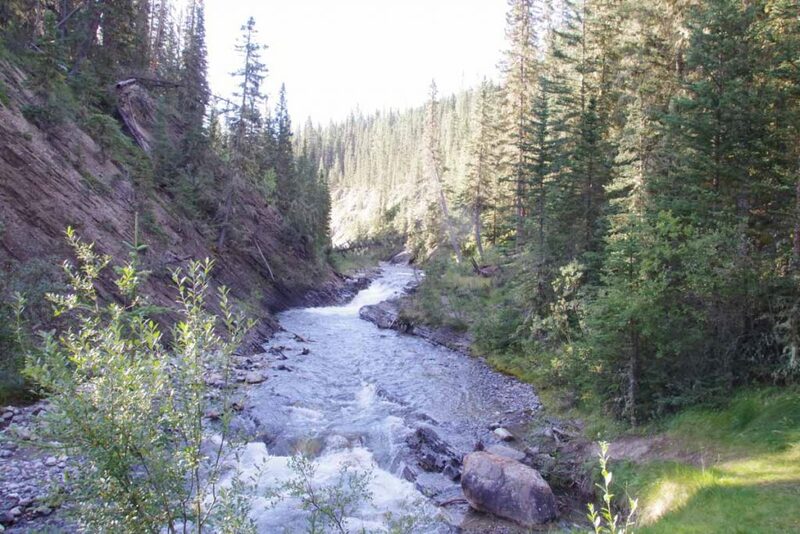 Woke up a little later and set off down the Elk River road. The road continued to be rough but gradually became better as got closer to Elkford. There were some shorter climbs, but overall lost more elevation than gained. Below is a photo of our Scottish cyclists. They were able to condense their gear into less space than mine. Along the way we had these trail riders coming the other direction. Without too much difficulty was able to make it to Elkford a little past noon. 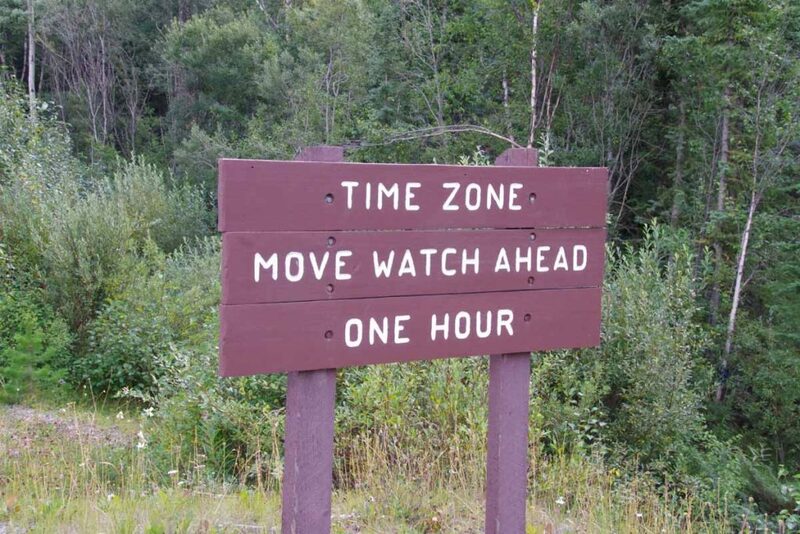 While this is part of British Columbia, I learned that this area still uses the same time zone as Alberta. Overall, three days of the GDMBR has given me a first taste of the GDMBR. Except for a section of trail replacing road, followed the official route. However, based on my first taste, do think I’ll try doing a hybrid with some road riding skipping some of the most difficult bits. For example, from here to Eureka MT is what looks like perfectly reasonable paved route – a lot of it is the original “Fernie Alternative” that was route before 2010. I will most likely take this paved route down the valley at least to Eureka. Also realized that not having the trailer is probably a blessing since that would have made the cycling a bit more challenging including pushing the bike up an 18% grade. Big thunderstorm as I awoke. Enough to fill all the divots from the rumble strips, but fortunately dry when I left. First day full loaded on the mountain bike. Overall I think my average speed was a little slower than the touring bike, though seems like my endurance was roughly the same. 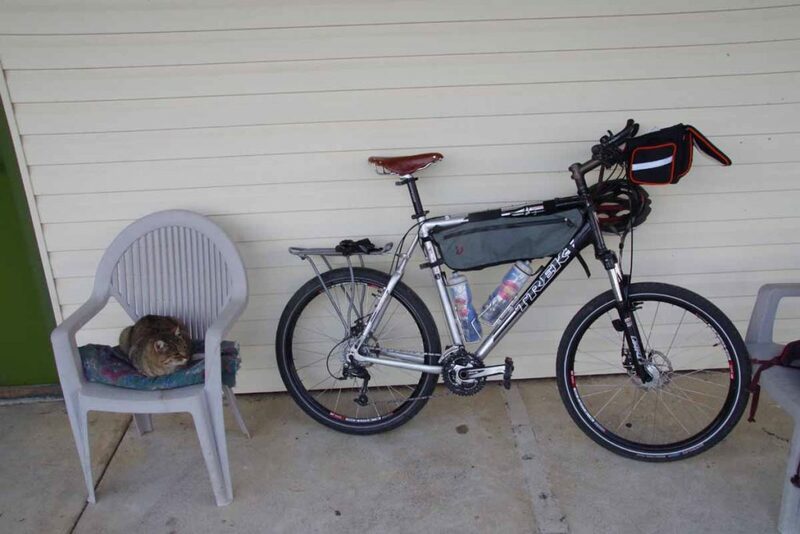 I also had somewhat less things, both the items I left behind and only having two panniers to carry everything. The first 17km retraced my steps to Robson Visitor Center. Above you can see the “after” picture with my bicycle. In the 10km after the visitor center was a substantial portion of the climb for the day. I put it in low gear and slowly wound my way up the hill. A little past the top was Moose Lake and for rest of the day no huge climbs until after Jasper, though some smaller ones to keep everything challenged. 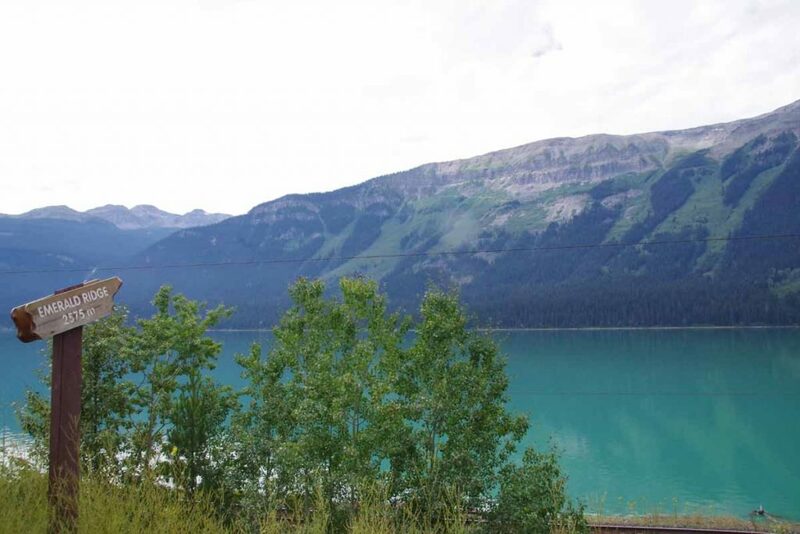 Photo above was Moose Lake and then Emerald Ridge in the background. 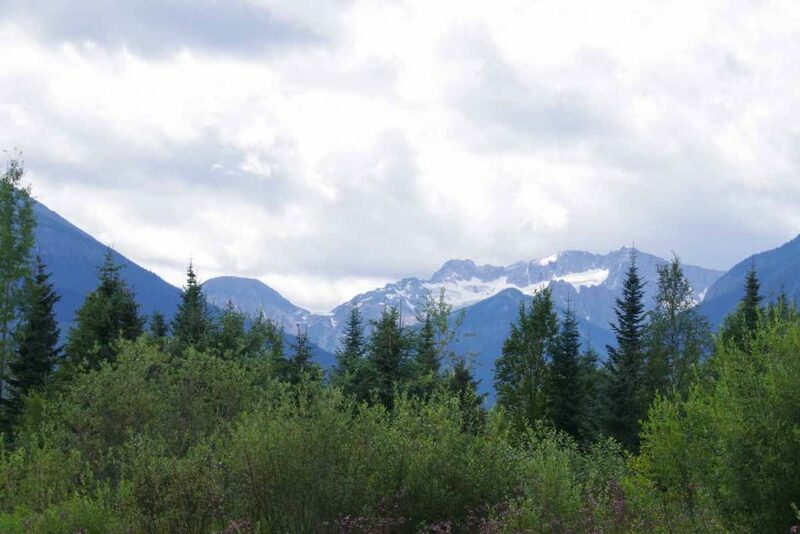 The peaks in Robson park were already stunning and could tell I was coming into the Rockies. 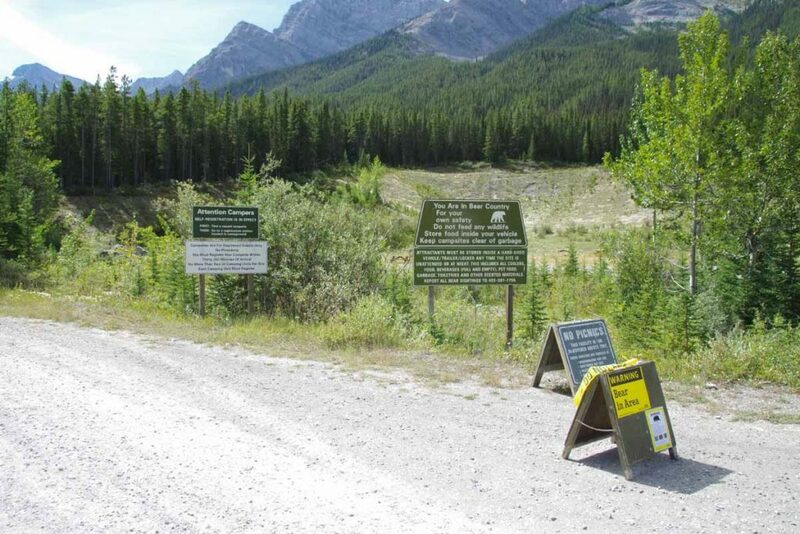 As well as boundary of Jasper National Park. 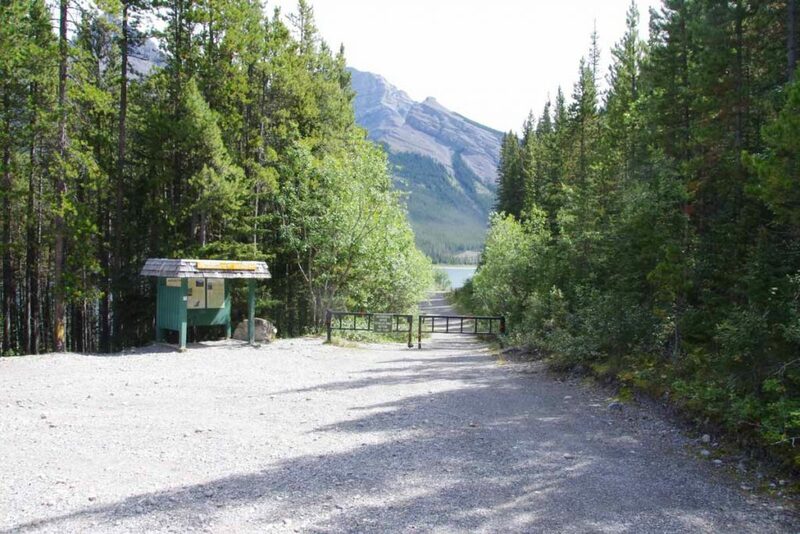 Five kilometers past the park boundary was an entrance station where I paid fees so I could stay overnight the next six nights in Jasper and Banff National Parks. 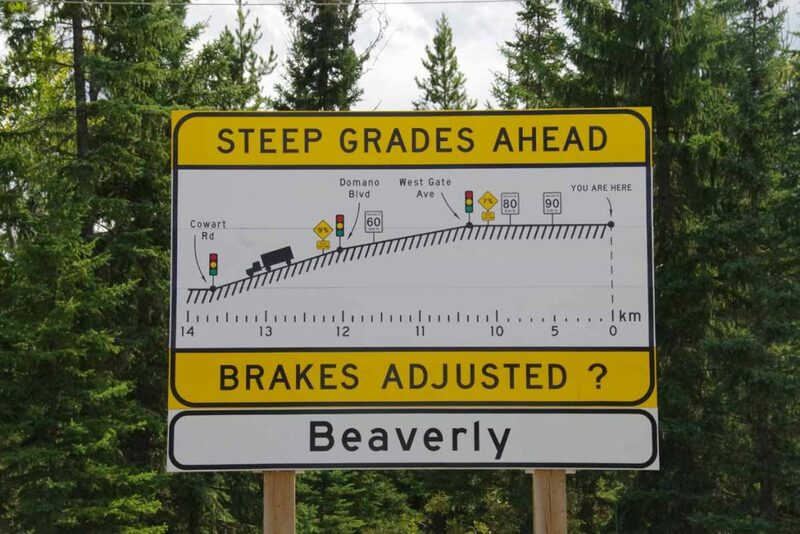 The next 20km was to Jasper town and was almost level with not much drop from the pass. I did spot a few cyclists again. 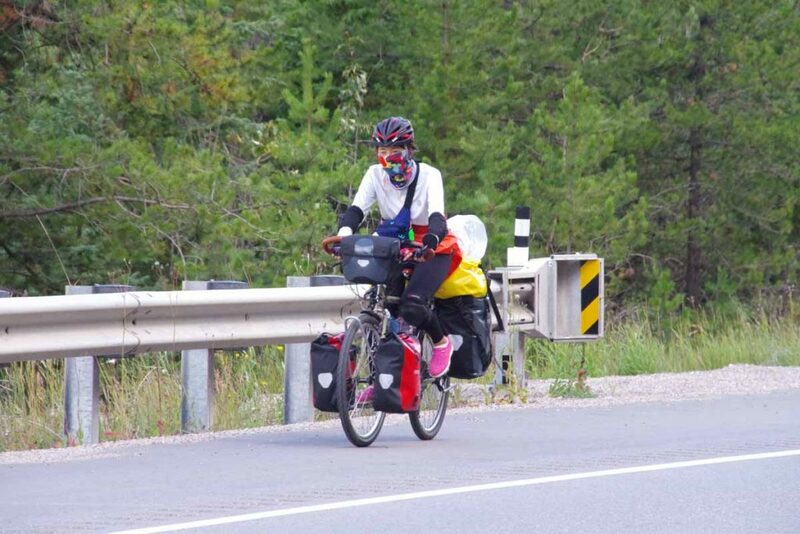 Without much difficulty I found myself at 104km into Jasper town itself. I found a bike shop and bought two inner tubes and also a restaurant and grocery to refuel for both afternoon and next several days. 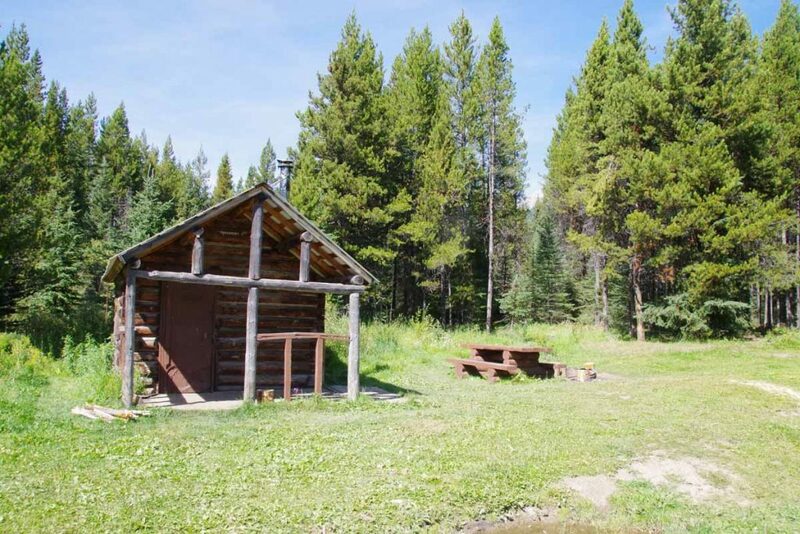 However, I wasn’t done for the day as my campground was located 18km south of town. Sounds like good advice below, though not real practical if your “vehicle” is a bicycle. I took the main road and slowly headed south. 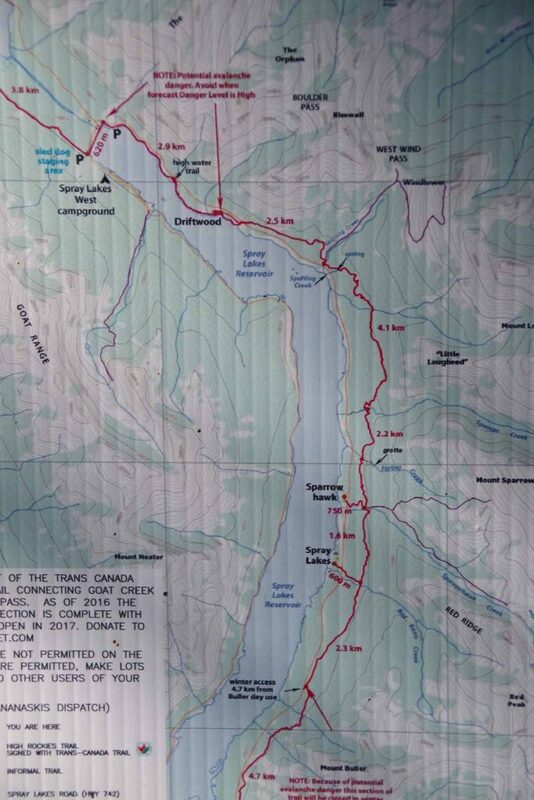 At 10km was a split into the 93A which went on west side of the river where campground was located. There was a surprisingly big hill in those last 8km and then a descent back down to the river. Overall 122km and a long day. At the campground entrance they informed me they didn’t have bear lockers and if I had food, I would need to give it to them for safe keeping. I asked if instead I might have a fellow camper in next site lock things up. Fortunately, they agreed and fortunately friendly folks across the way kept my food bag for the night. No room at the inn. All campgrounds and motels in Jasper are full today. Hence, made a reservation for tomorrow and took today as a rest day in Tete Jaune. Bert left today so the bike switch was also finished today. 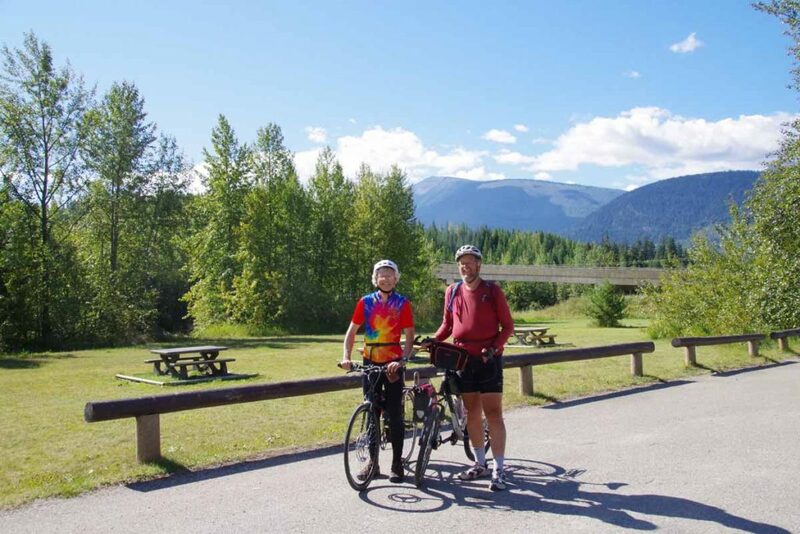 However, before leaving we had a ride together and a car shuttle: Bert drove to Robson Visitor Center and cycled back, we both cycled to Robson Visitor Center and then I cycled back. Photos below in that segment, I’ll also cycle it tomorrow but nice to see it at more leisurely and tourist pace. 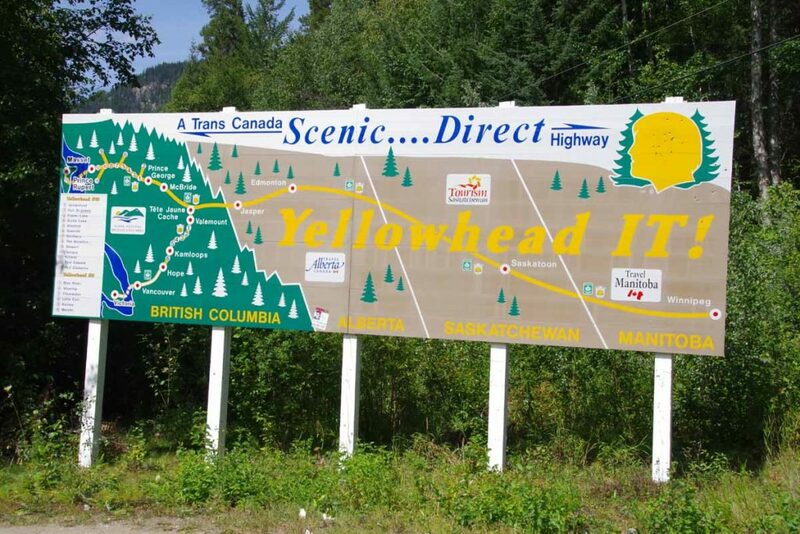 One kilometer from here is road junction with highway five (also named a Yellowhead highway). After that point the road became noticeably busier. 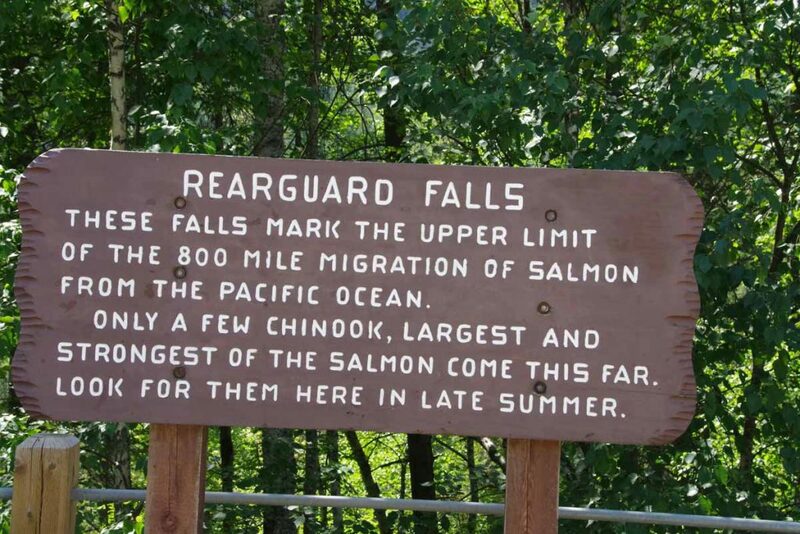 A few kilometers past that was Rearguard Falls. 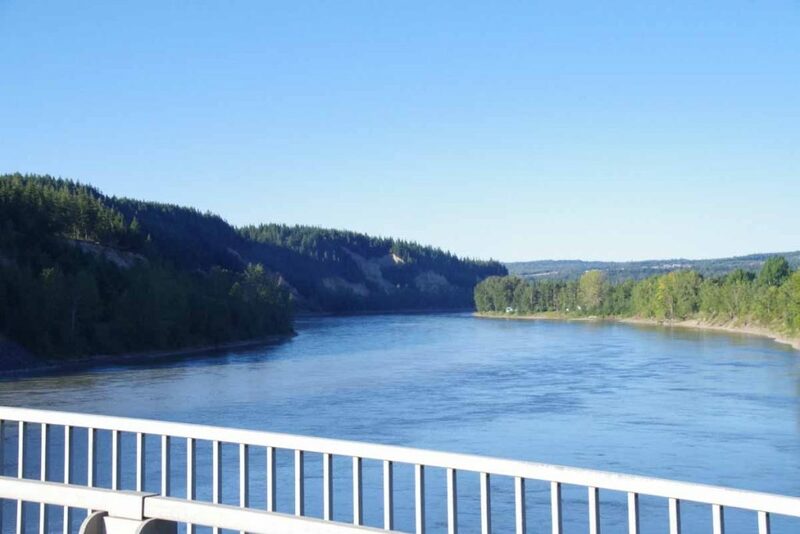 Salmon swim all the way from Vancouver up the Fraser River, but this point marks the furthest almost all of them reach. A few kilometers past that is a rest area for Terry Fox. 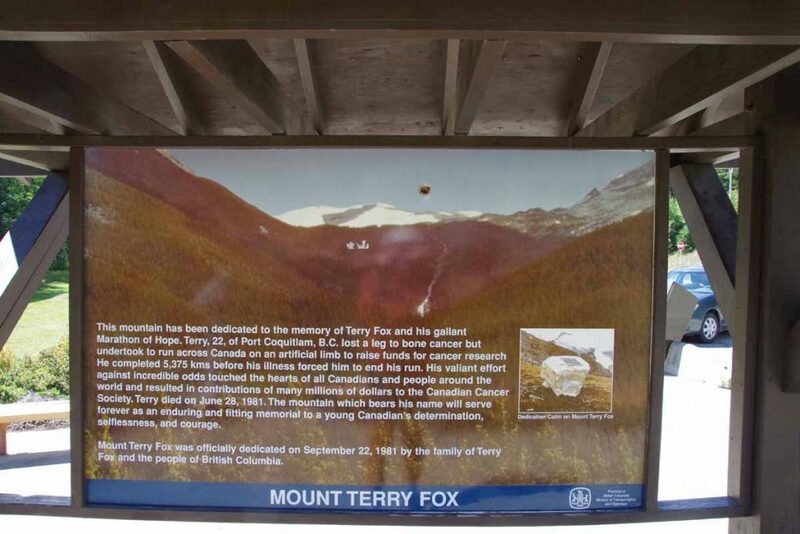 Also the nearby mountain shown above is Mount Terry Fox. The more complete story is described below. 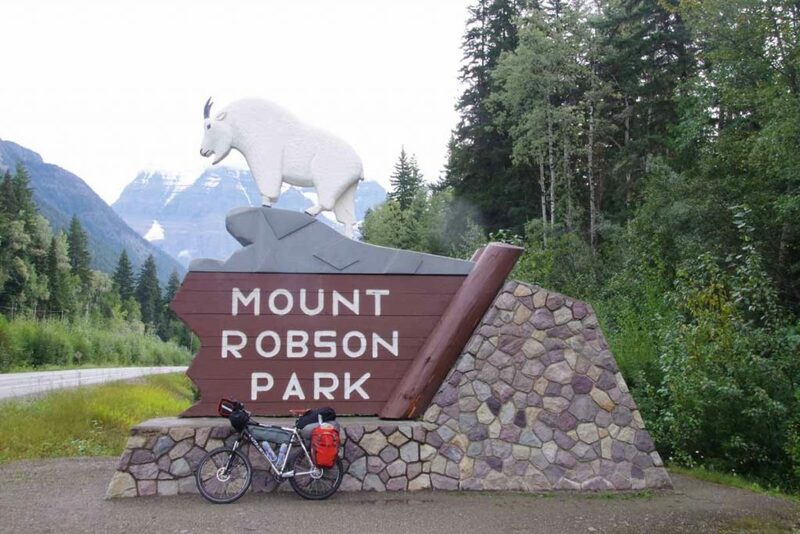 A few kilometers after that was entrance to Mount Robson Provincial Park. 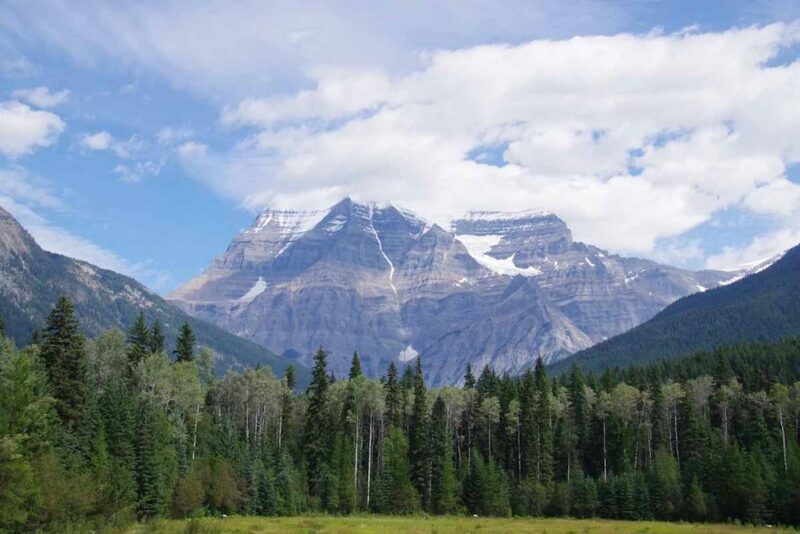 The big mountain in background is Mount Robson, highest mountain in the Canadian Rockies (3954m or 12,972ft). The summit was obscured by clouds but still looks impressive, particularly given that the road elevation is ~900m so ~3000m (10,000ft) above the road. 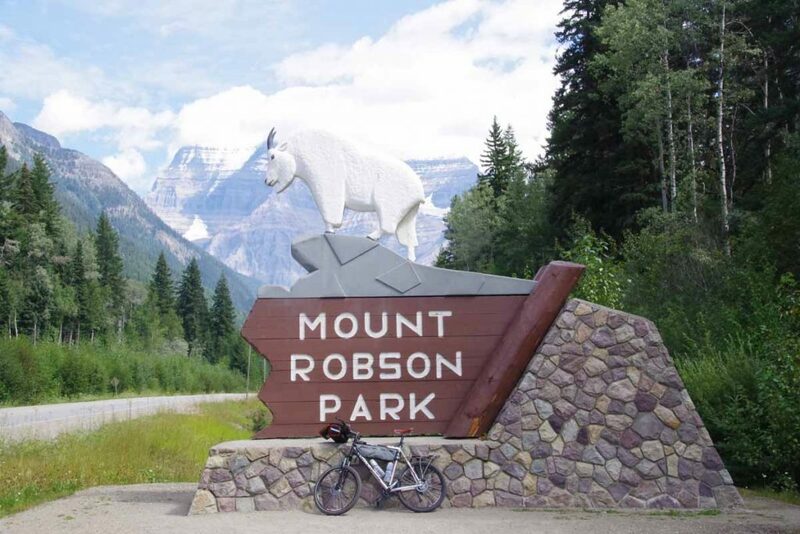 At 17km was Mount Robson Visitor Center. Nice views of what we could see of the mountain. Also a visitor center and cafe. Surprisingly busy with tour buses. I have a suspicion the large crowds will likely be with me all the way to Banff. Fortunately, road shoulders so far were still reasonable. 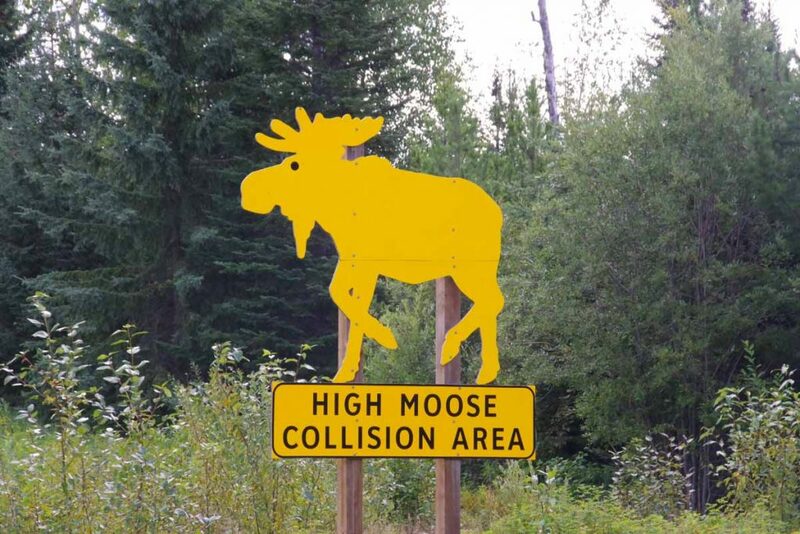 I did ask more about the “Tete Jaune” vs. “Yellowhead”. The name came from an Iroquois guide Pierre Bostonais who had blonde hair and guided people across the low pass. 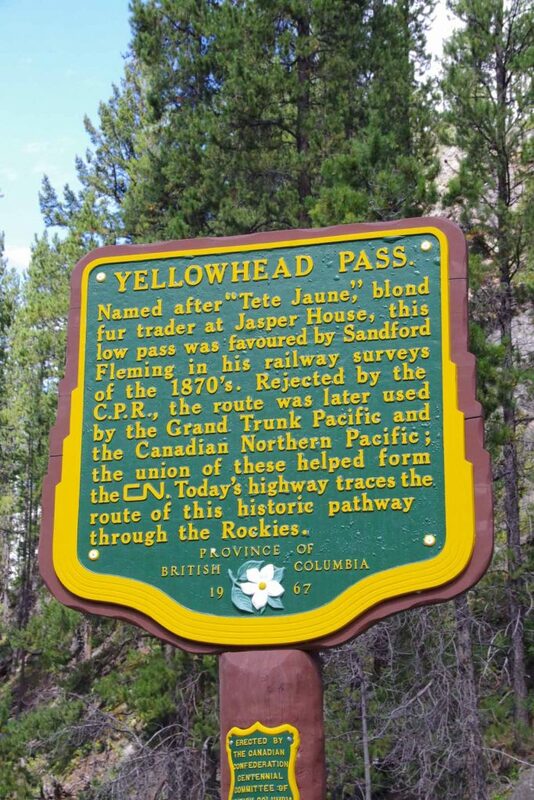 However, folks at the visitor center couldn’t explain why Tete Jaune Cache town was named in French and the Yellowhead Highway was named in English. 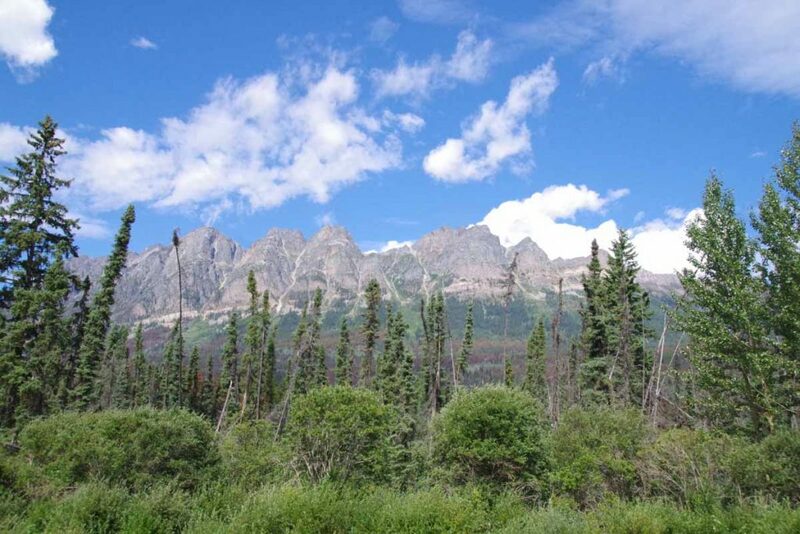 I have campground and hostel reservations next five nights and then hope to start the Great Divide. Not sure how much wifi I will see before then. Today was third in that sequence as I put together my mountain bike and Bert helped by SAG some pieces as well as then meeting me for part of the ride. McBride was small town yesterday – we found all the restaurants except the Chinese as well as discovered the grocery store closed at six. Not to worry as we picked up a few things before leaving. It was a short ride today and I put together my bike to ride the 63km and Bert drove to end point and cycled back to meet me. 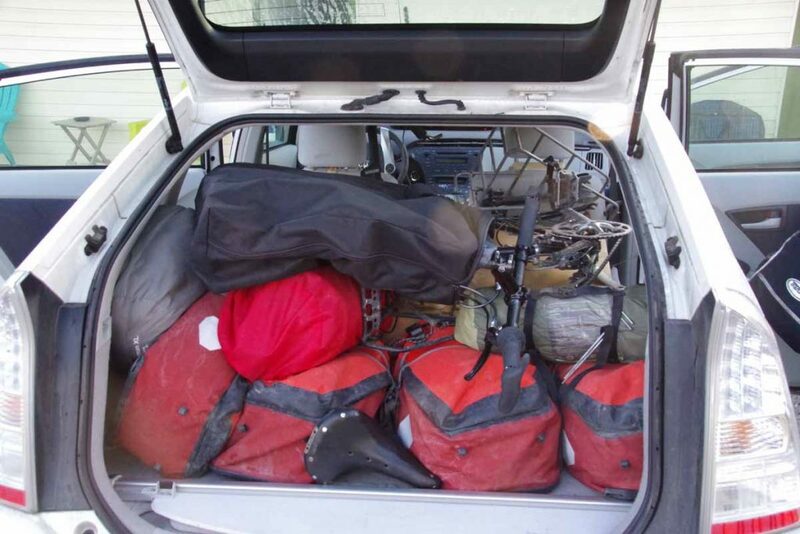 Touring bike and some panniers and other items back in Bert’s car. The valley was pretty flat and not much climbing today. Also started seeing some higher peaks along the way. Part way along met with Bert and got a photo and nearby rest area where you can see some, but not most dramatic peaks behind. After that a fairly quick ride to the motel at the junction here. A few items discovered in past few days that cause some adjustments to the plan. I opened the box for the bike trailer and it was missing a key component: a hitch that connects the trailer to the bike. My mountain bike has a back rack and I’m able to condense everything into two panniers on the back, so can still proceed from here but will do this without the trailer. Meanwhile, I’ve ordered a new hitch. Not quite sure how that happened and will also check with the company. Meanwhile it also lets me try to figure out a key question…why is Tete Jaune, the small village, given the French name, but Yellowhead, the highway given the English translation? 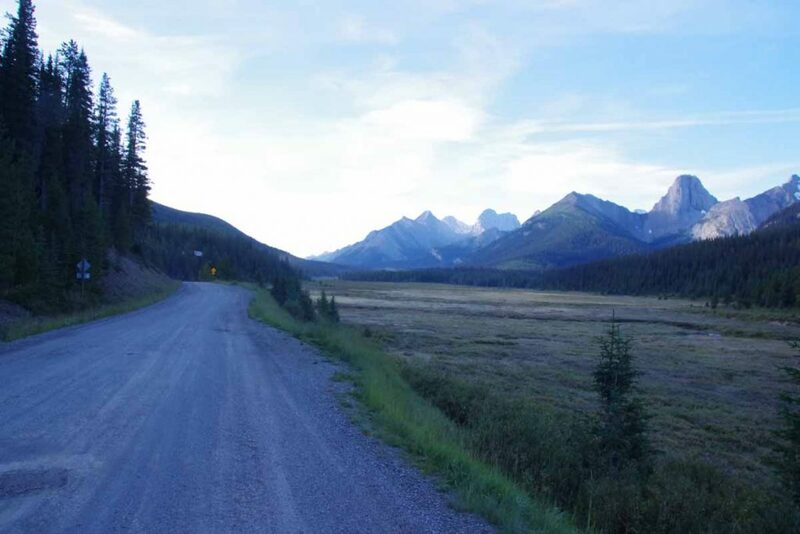 Two days cycling brought me to McBride. 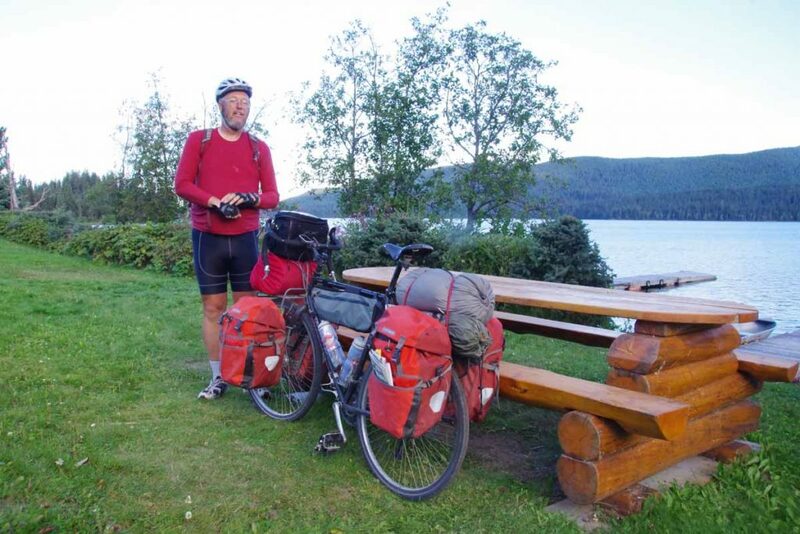 I met my brother Bert at end of first day and hence cycled w/o gear on the second day. 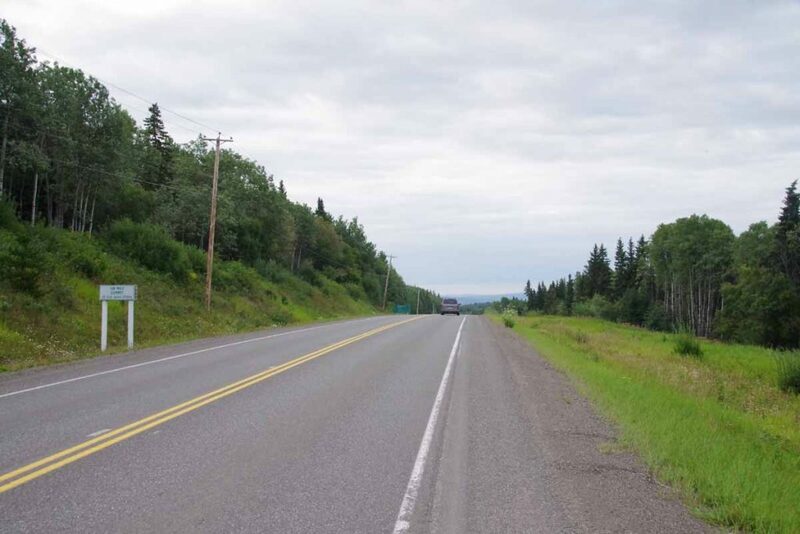 The Yellowhead had good shoulders all the way to McBride and less traffic than I had seen west of Prince George. 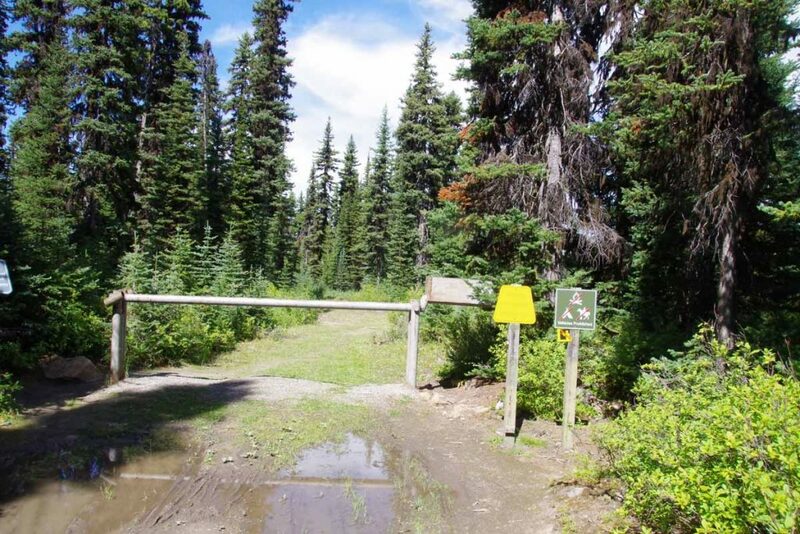 As I left town I came past several cross country ski areas as well as some local hiking trails. 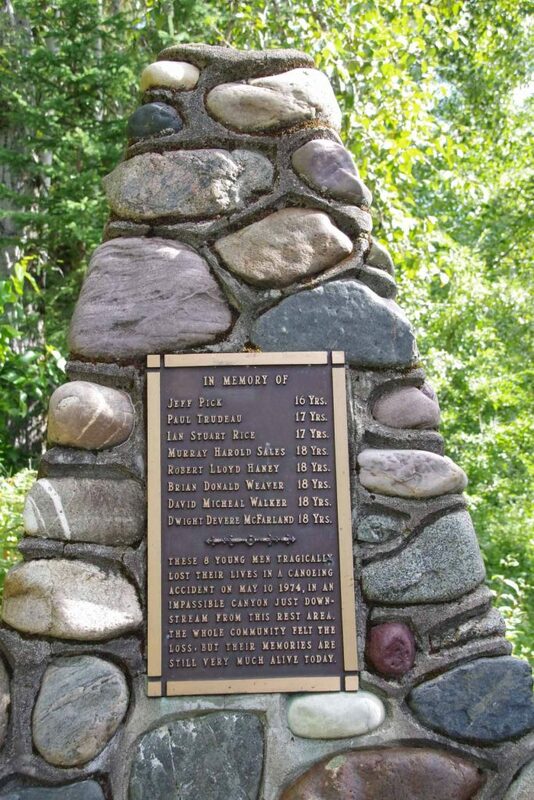 I stopped at a rest area by the Willow River and also found a monument to eight teens who had lost their lives in a canoeing accident. After this mostly rolling terrain as well as some signs warning of wildlife, though I didn’t see much wildlife. At 63km was Purden Lake Resort. Even before I got there they had put up signs taunting “homemade bread”, “pie”, etc. However, the cafe is only open Thursday to Sunday so everything was closed. I was able to get a camp site right next to the lake. 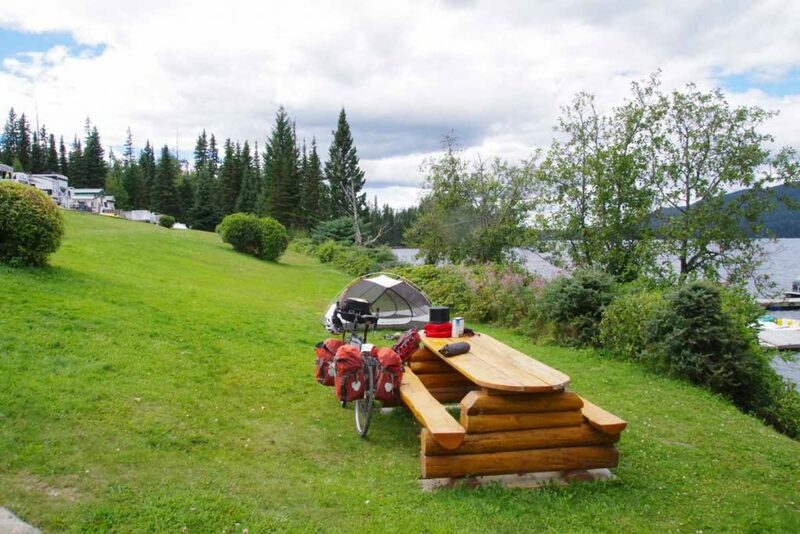 This resort appears to cater to those from Prince George (45 minutes away, everything seems to get described in minutes) – some of whom put together semi-permanent looking RVs with balconies, sheds, etc and then have a place in the country to visit or even live. Yup, with Bert’s SAG help, I could ride without my gear for a day. Bert drove a ways with the car, cycled back to meet me and then we cycled a bit further before he went back to the car. Much appreciated. It wasn’t very cold overnight and next morning I was on the road shortly past 7am. It was nice cycling without my extra gear and I made it 47km before I met Bert coming back the other way. On the way were some short hiking trails such as the one below. 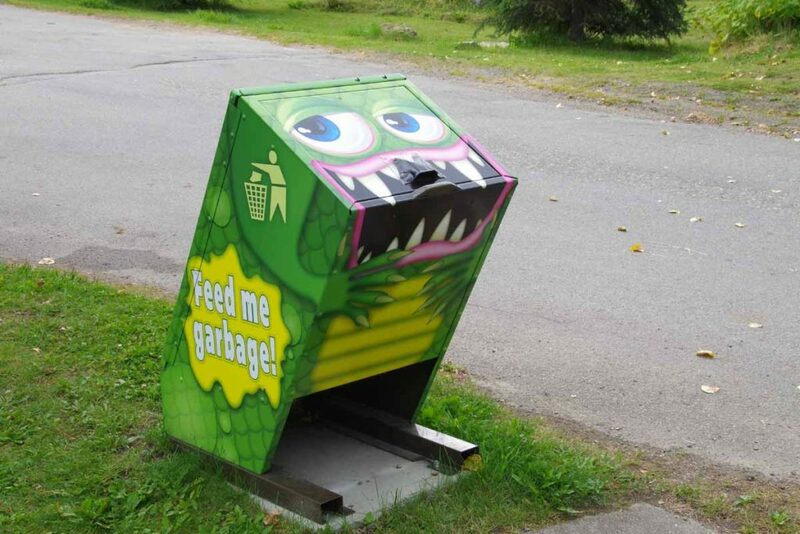 We met at a nice rest area at Slim Creek where they had also decorated one of the bear proof containers. After that there the route had a good share of hills. Also some more distance scenery. 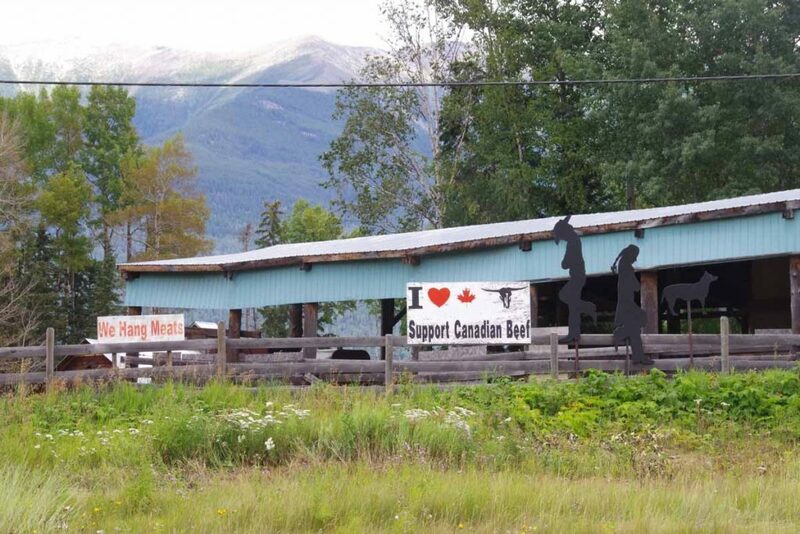 It was a somewhat longer ride, 147km total and this brought me to small town of McBride. Seems to be a bit of a ranching town. It was nice to finally see the services sign. 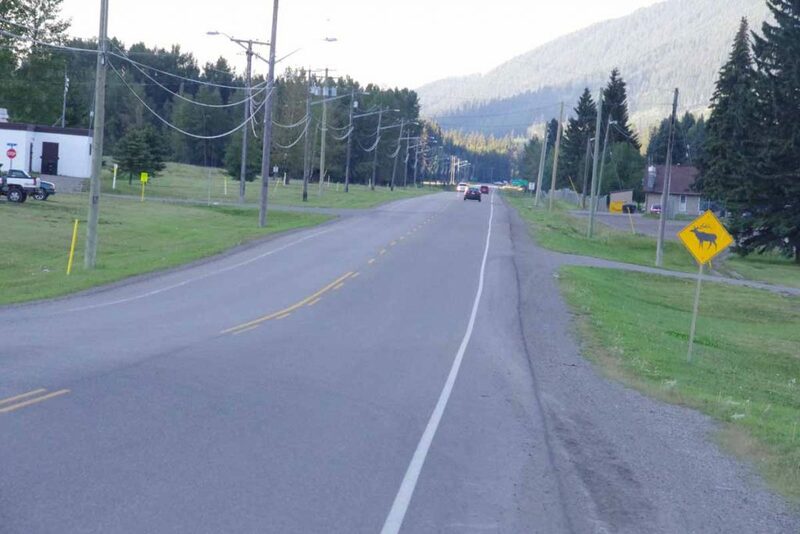 I have come through approximately a dozen towns in the past fifty days that are large enough for a grocery store: Fairbanks, Delta Junction, Tok, Haines Junction*, Whitehorse, Teslin, Watson Lake, Dease Lake, Smithers, Burns Lake, Vanderhoof and Prince George. 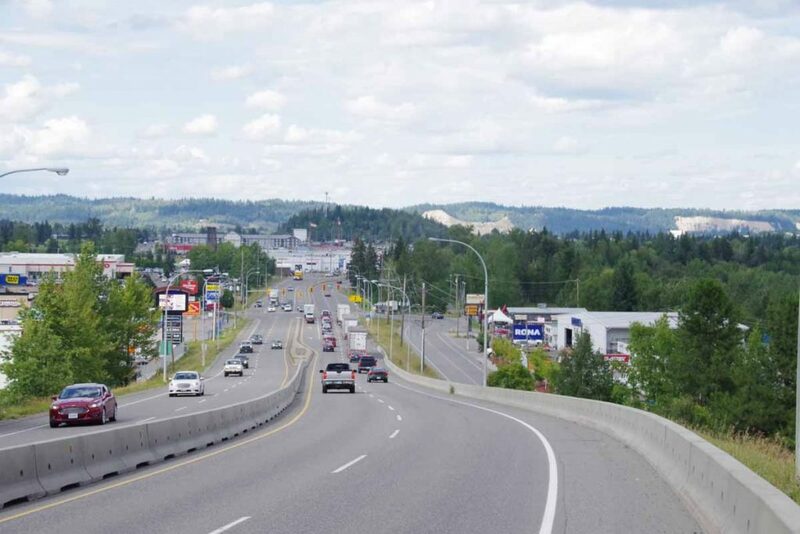 However, the population of Prince George (~71,000) is about equal to the population of the other eleven towns combined. Counting grocery stores is subjective to figure out the boundary between large convenience store (Otter Falls?) and really small grocery (Haines Junction) but close enough for this calculation. Today the road was surprisingly busy – particularly with log trucks and large double long “Ledak” trucks that smelled like cut timber. 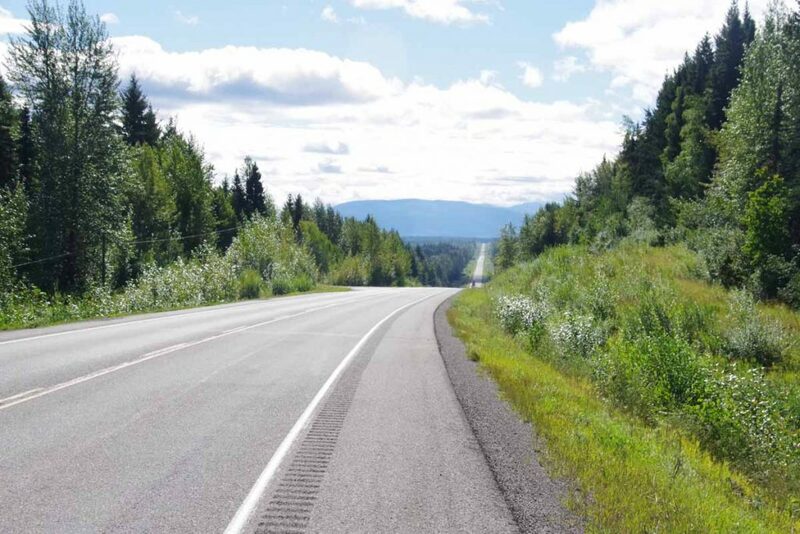 I’ve browsed other journals to get an idea of road conditions and other travelers have complained about lack of shoulders and heavy logging traffic – so I kept track. Approximately 25km of the route today didn’t have shoulders – so required extra concentration. Only one instance where an oncoming truck making an unwise pass forced me off the road, but needed to watch more closely today. 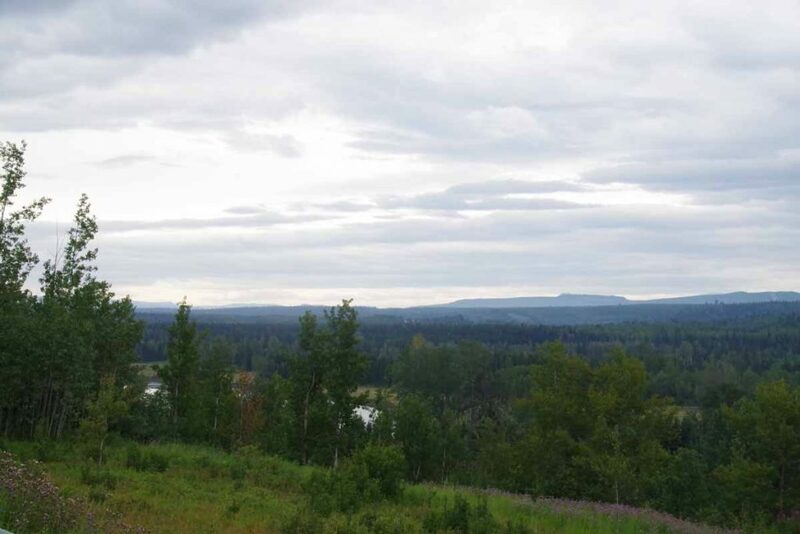 It was occasionally raining when I left Vanderhoof. Climbed up out of the town and then mostly ups and downs after that. 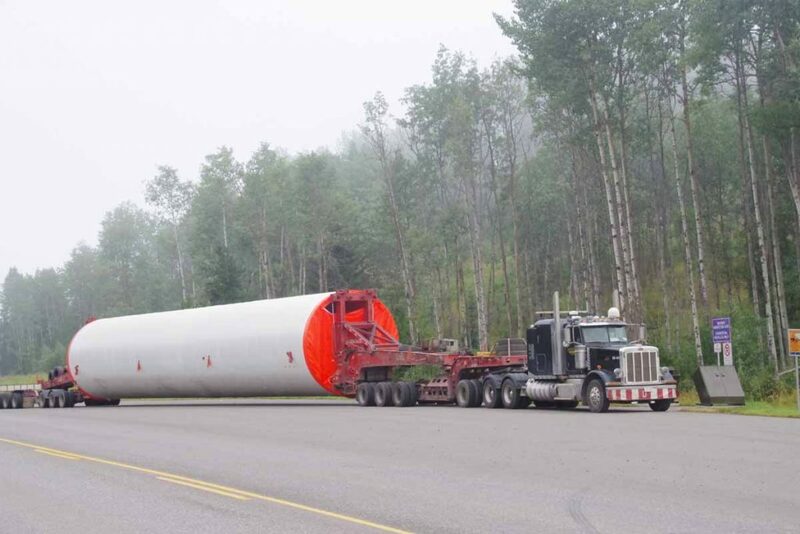 I was trying to figure out where all the log trucks were going, particularly with a big mill in Vanderhoof and apparently they pretty much continued all the way to Prince George. The first 23km had a reasonable shoulder. At 23km my nice shoulder went away. 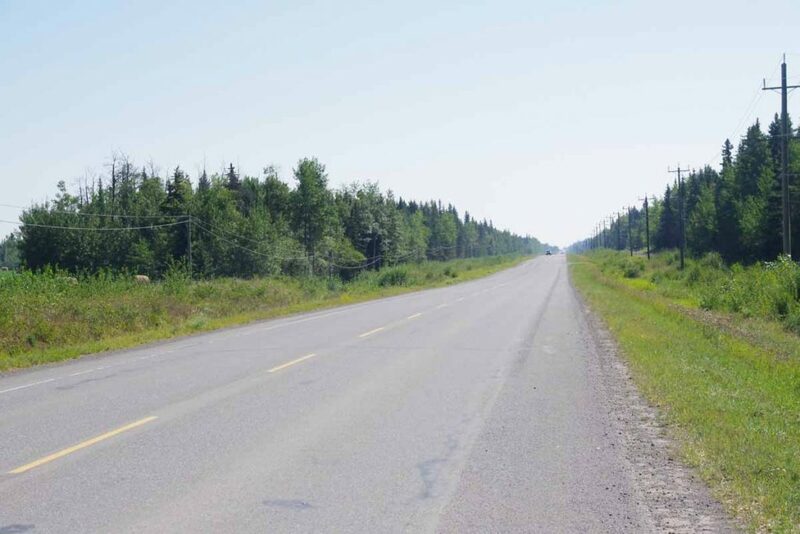 Ten kilometers further was Brookside RV park with small store. Stopped here and had a second breakfast (Bednesti resort near 47km was closed). Also saw some of these large trucks parked, so somewhere up here they are putting large wind turbines. After breakfast some more “no shoulder” riding and some up and down hills. Before 50km, the shoulder reappeared and was there for rest of the day. 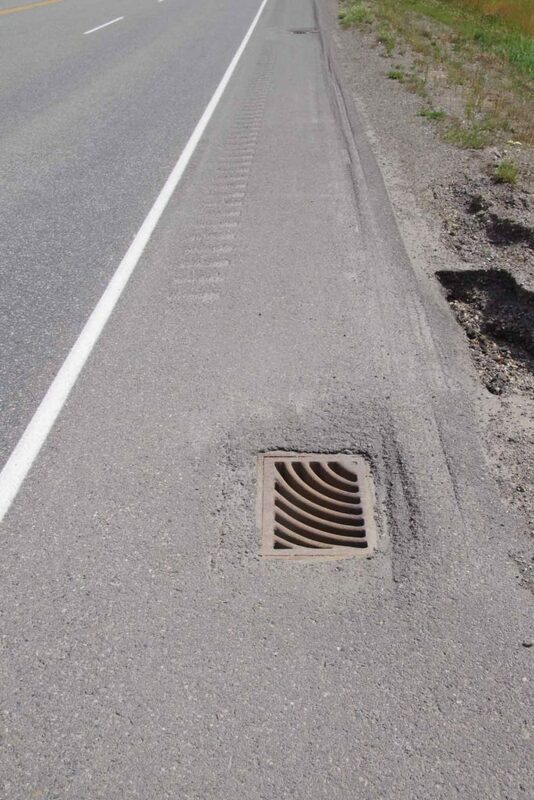 However, counted in that was a short section shown above where traffic designers decided to put in both a rumble strip and grates in side of the road. Pretty sure that designer wasn’t a cyclist. 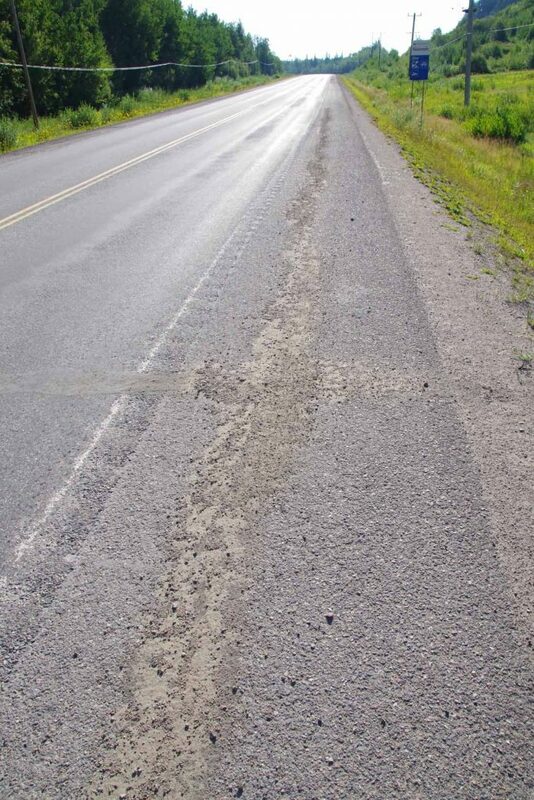 Fortunately, it was only a short stretch and I could ride to left of the rumble strips to avoid the mess. At 75km was a steep descent to Chilako River followed by a “chain up” area and then another climb. Not much later was a Petro Canada gas station/store at 82km and chance to refuel and take a break. After this as sign above shows, it was more downhill than uphill. 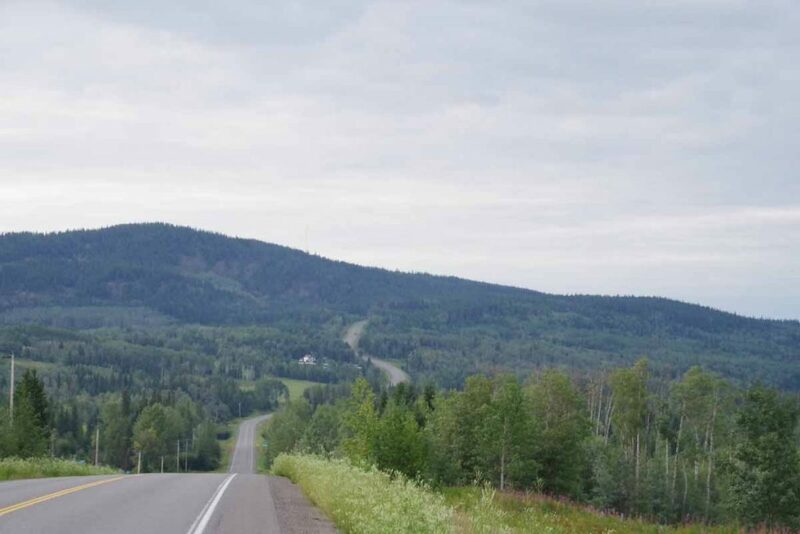 At 90km the road became four lanes and had some good descents coming down into Prince George. Traffic also got quite a bit busier. 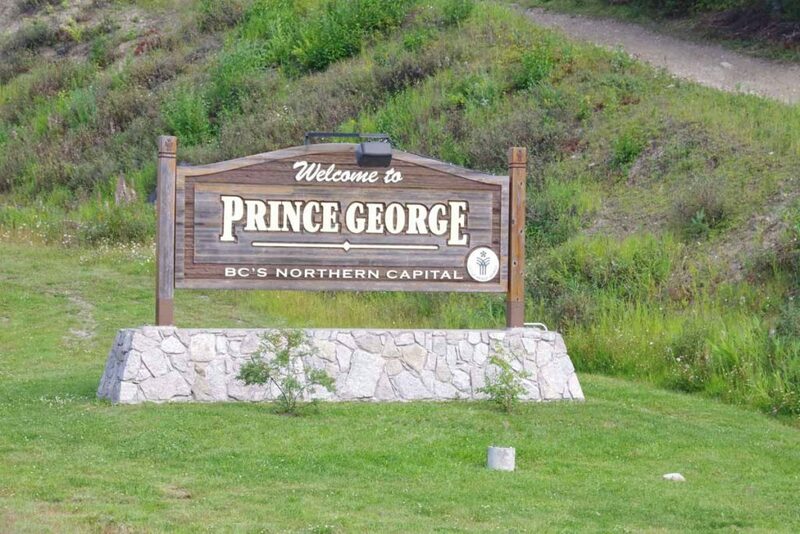 Prince George bills itself as “BC’s Northern Capital”. One of the last downhills into town. I passed the major intersection of Yellowhead (#16) and Highway 97 and then not much later came into city center with grid of streets. Found a motel downtown and happy to get to the big city. After today, expect a transition of sorts. My original plan has a Phase 1 on touring bike followed by a Phase 2 on mountain bike. My brother Bert is kind enough to bring up the mountain bike and help make the swap. We’re doing this in next few days and Bert will join me for a few days and after that Bert will leave with touring bike. A shorter ride that wasn’t too difficult. Landscape was flatter today with a lot of flat straight segments through the forest. There were two climbs today when I shifted back into granny gear and rest was zipping along in mid-range gears. They are busy “crack patching” in the section between Frasier Lake and Fort Frasier. The first 20km the shoulder had a lot of segments like above where they’ve put tar to seal the crack and then a generous amount of gravel on top. On the primary driving surface the gravel quickly goes away but sometimes had a few bumps on the shoulder. Enough log trucks and other traffic that I was mostly on the shoulder. Stopped briefly at 21km in Fort Frasier at local store here. 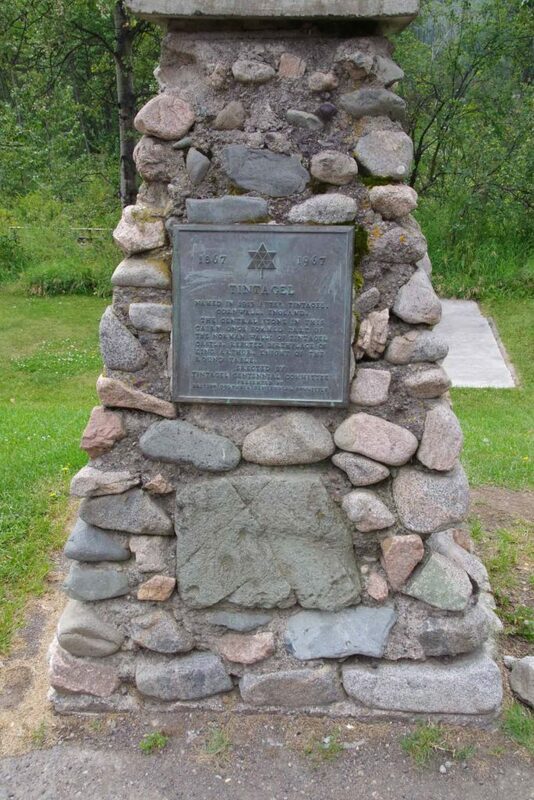 Also signs indicating the “last spike” of the Grand Trunk Pacific railway was placed here. After that a climb coming out of Fort Frasier and then mostly flat. The road had long straight sections and hills only came when this cross-route cut across some roads. 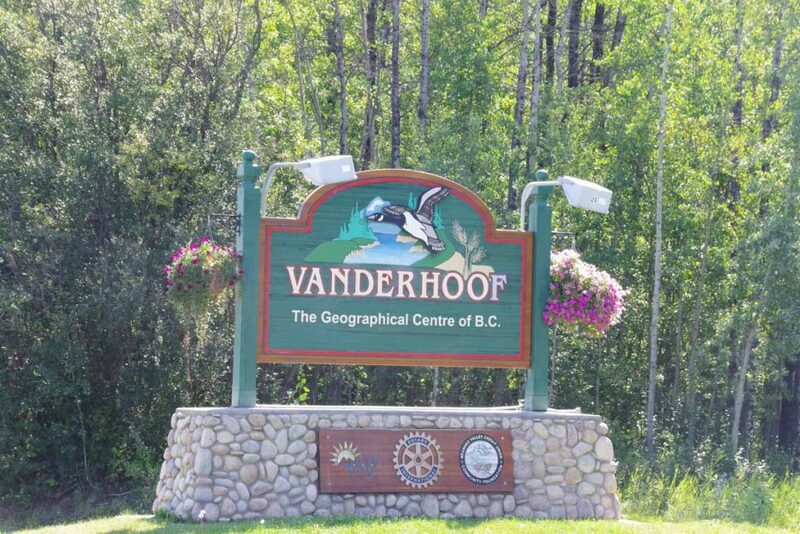 Claim to fame for Vanderhoof is that it is “geographic center of British Columbia”. A nice visitor center coming into town along with a museum (closed for the summer). A few motels and nice small downtown street. Also a grocery store. Otherwise, I was in town by mid-day and took and easy afternoon – since do not expect much between here and Prince George (PG). With a population of 71,000 PG has more people than any town I’ve been through so far. One sobering note in the afternoon I noticed the street in front of the motel was very quiet. Thought it might be the road construction/paint striping going on, but discovered ~4pm there was collision between motorcyclist and jeep. Police had closed off the street before doing careful forensics on the crash and street was still closed several hours later. Motorcycle was type with large “panniers” so likely a traveler. Can’t be too careful. The terrain today was a little flatter. Today a slightly longer ride both in terms of distance and time. 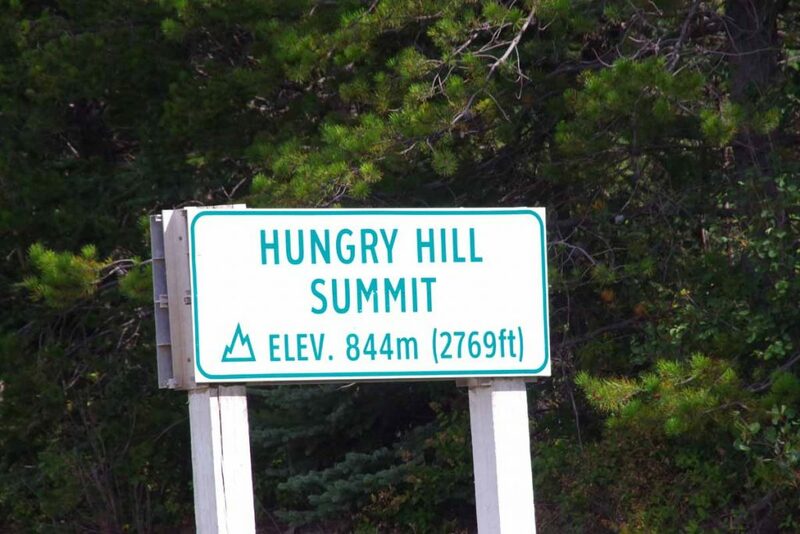 The first ten kilometers started with a climb up to the top of Six Mile Summit. Here you can see the final approach on the hill. It was only ~3km but got a bit steep towards the end. There was a chain up area at the bottom and a chains off at the top. Nice to get that out of the way at start of the day. Here is the top of Six Mile Summit. In the rest of the day there were two or three short steep hills but overall the land was becoming a bit flatter and there were also long stretches of flat land. Some areas of agriculture such as these with large hay rolls. Once I crossed Six Mile Hill the rest of the ride into Burns Lake at 52km went fairly quickly. Signs indicated there was repaving and I saw some newly paved pieces but fortunately no construction on Sunday. Once in Burns Lake, I met up with Jared Lester. Jared is working in town for BC Wildfire Service – as a summer job before he goes back to school in the fall. We both cycled TDA in 2013, though Jared was a stronger/faster cyclist and was able to ride every inch of the designated route. He was 18 then and youngest rider in TDA 2013. Nice catching up with him. 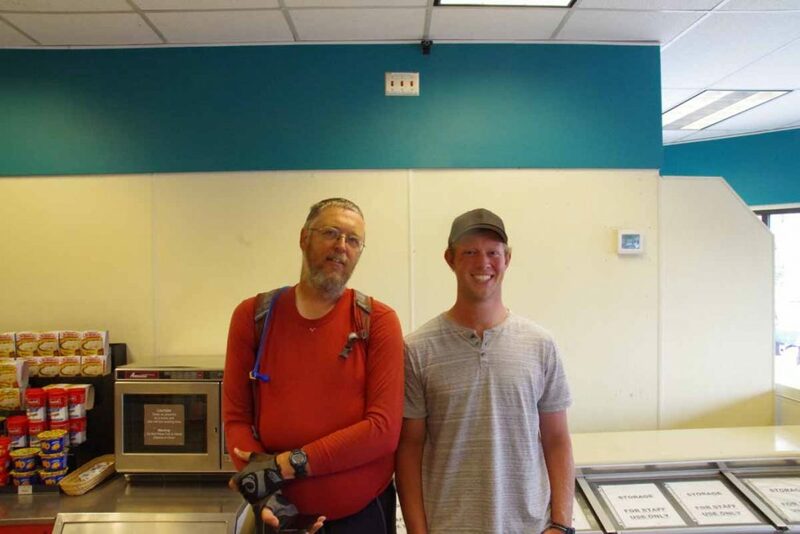 I call this a “joint mug shot”, taken by convenience store clerk, though we’re both smiling. After that got some lunch and then headed out. There weren’t too many places to stop very nearby, but figured I wanted to at least get close enough to Vanderhoof that I could reach it the next day. The route went up and down past the lake but continued to be somewhat flatter than previous days. The travel lane was nice and smooth and sometimes the chip seal shoulder was extremely rough – hence I alternated between riding in the shoulder and on the white stripe. 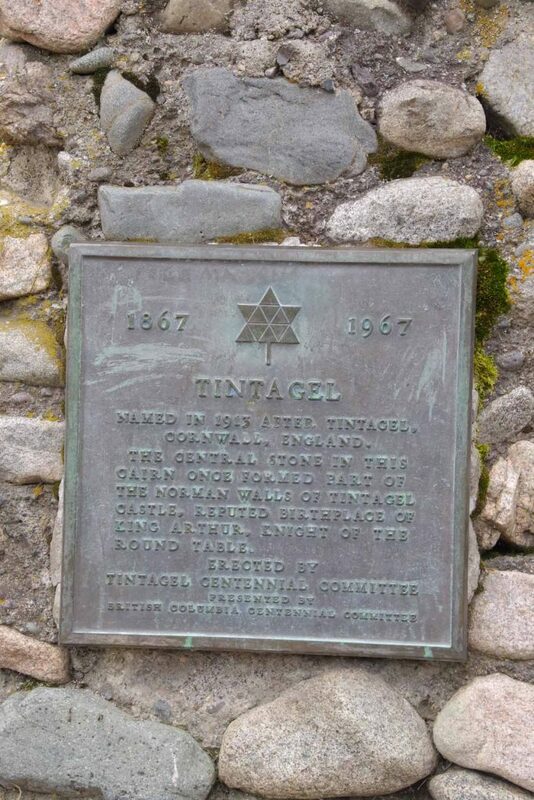 One rest area had this cairn with an inscription (below) that suggested the main stone had once been part of the castle where King Arthur was born. 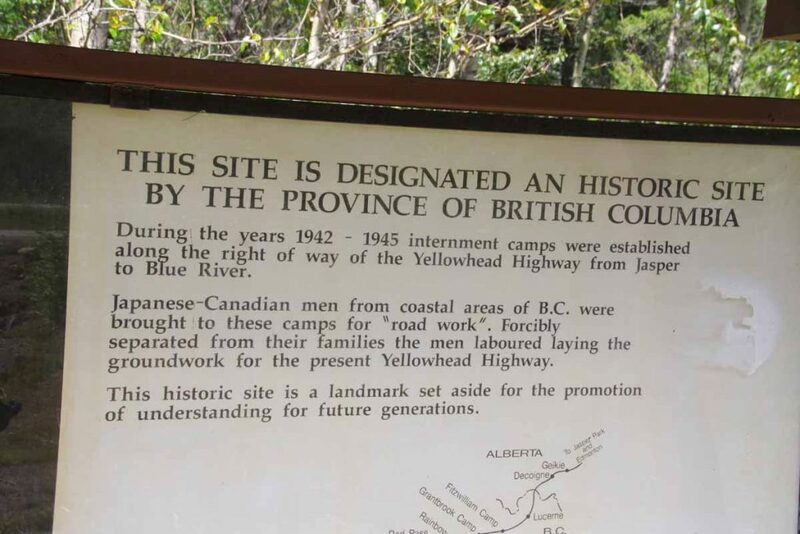 If so, who and why was motivated to bring that stone here to middle of BC? Here is another small lake. The signs indicate “Lakes District” and there are several larger lakes out here as well. At 108km was Endako where the only business was this roadhouse. Just the right time and place to have an early dinner here. At 108km, I hemmed and hawed about stopping here and renting a room upstairs. 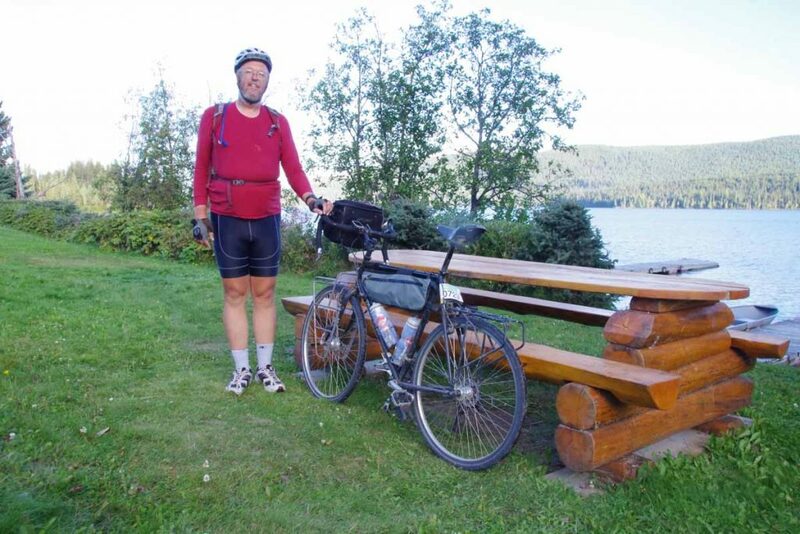 Finally decided to go just a little further and cycled to Frasier Lake at 121km to end the day. Nice to be on the road again after a week in Smithers. Fewer big peaks to pass by today as the landscape flattened out some. 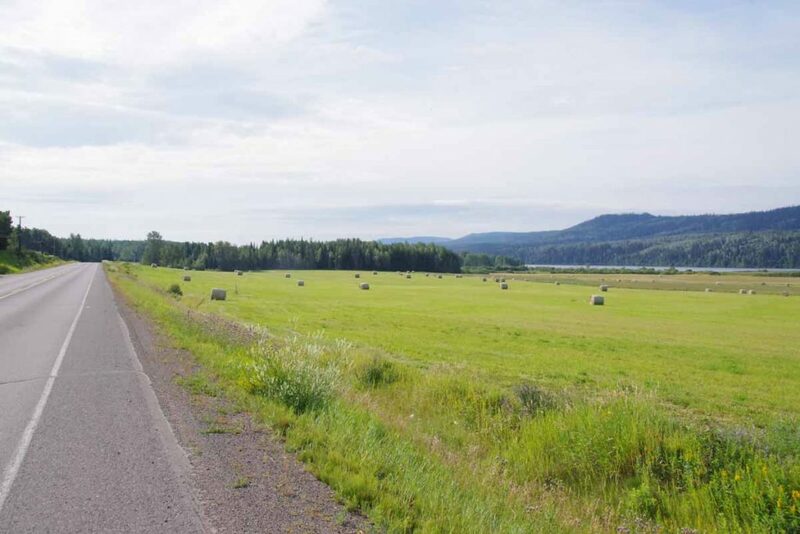 However, still some hills to climb up and over as the road mostly followed the Bulkley Valley. 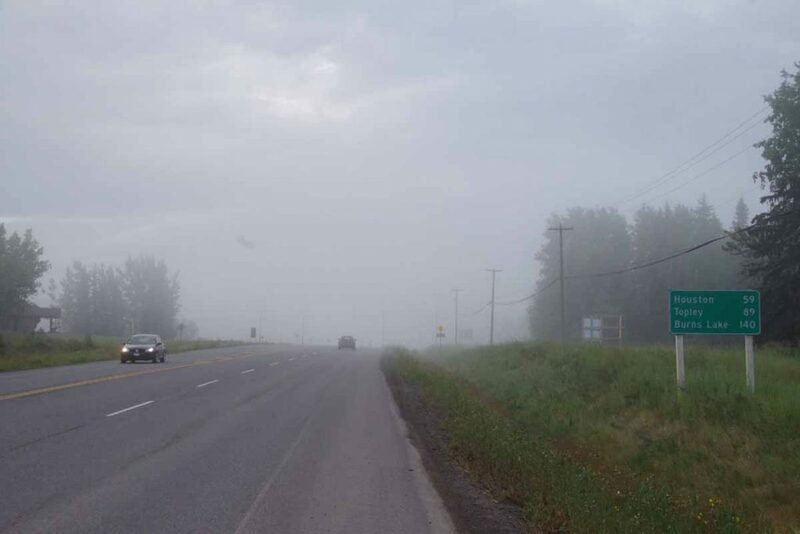 Foggy in the morning as I started out. The road sign gives a good idea of the overall agenda: Houston for lunch, Topley as destination and Prince George in a few days. The bike rode well and even “clicked” as the spring forced the new pawls out. I could definitely notice the difference and had no skip issues today. 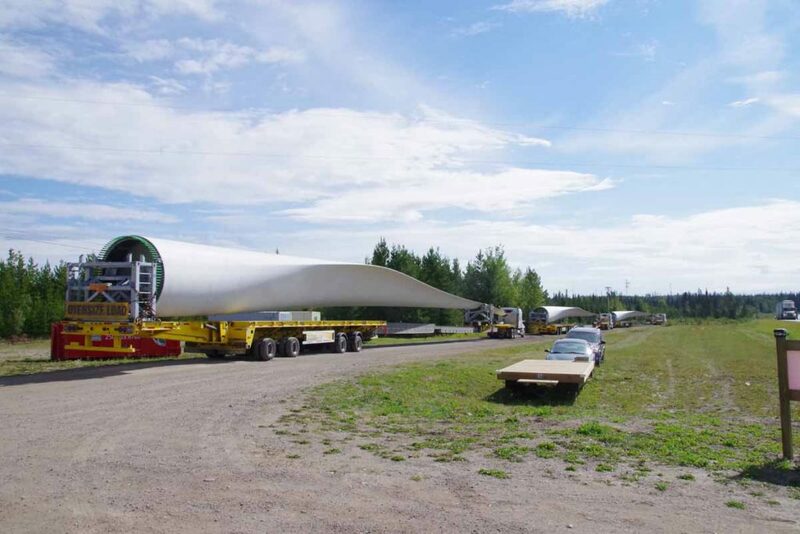 Photo above shows some of the sometimes large things that are moved on the road. 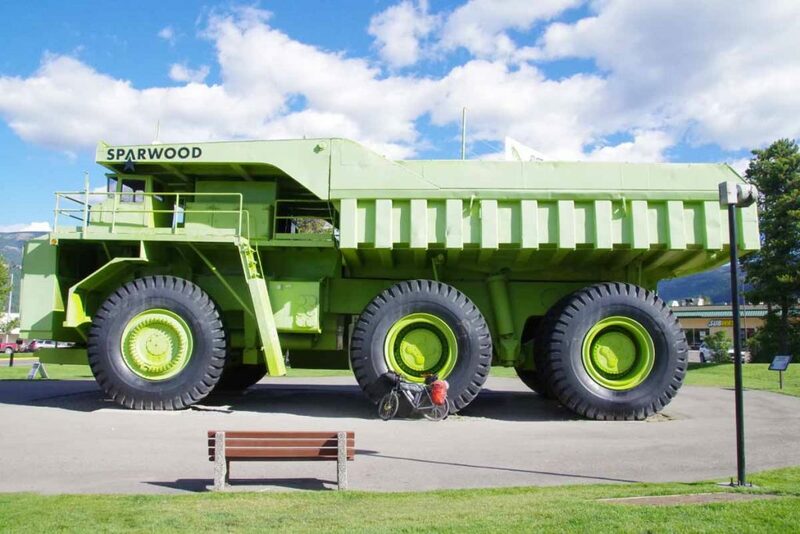 Something this big has a pilot car, but things only somewhat smaller pass with mostly just a “wide load” sign. 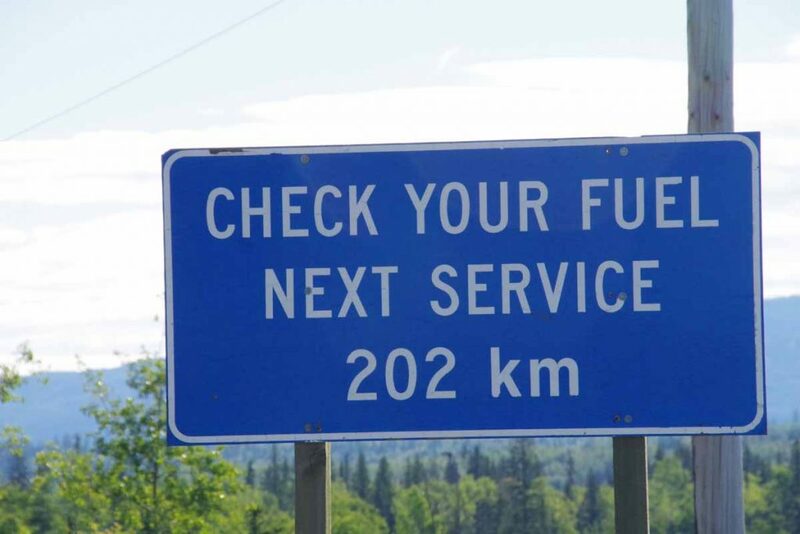 Fortunately, a reasonable shoulder on the Yellowhead Highway and traffic is also considerate. 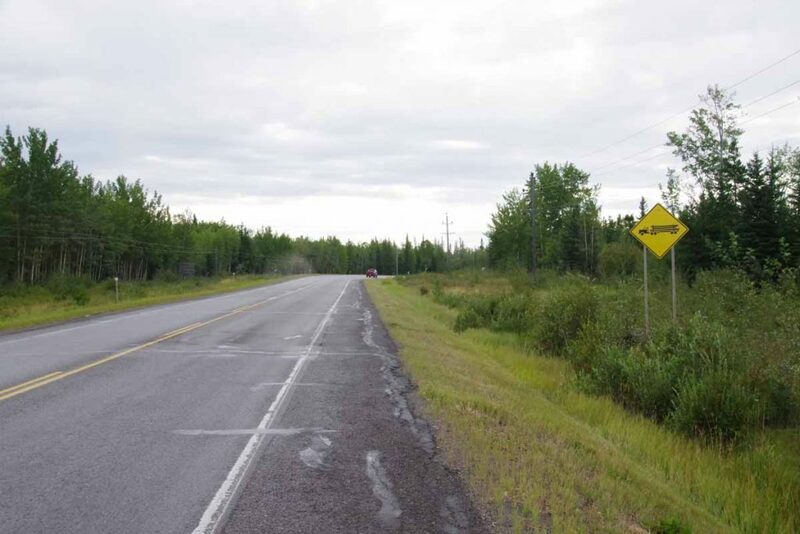 At 15km was Telwaka and shortly after that was what looked like some cabins with the following sign out front. 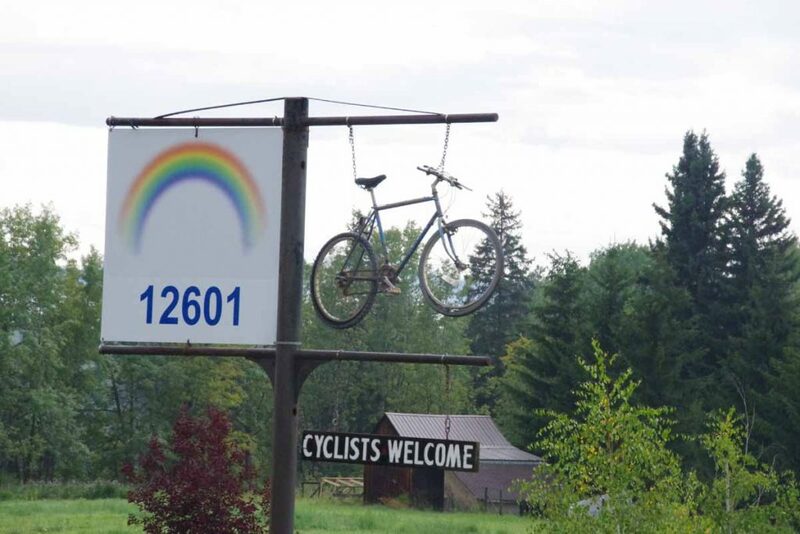 Of course had to get a photo of this which is second time I’ve seen a bicycle-specific welcome sign (the first was on Cassiar Highway before Irkut but it was cold and rainy and I was concentrating on keeping warm). 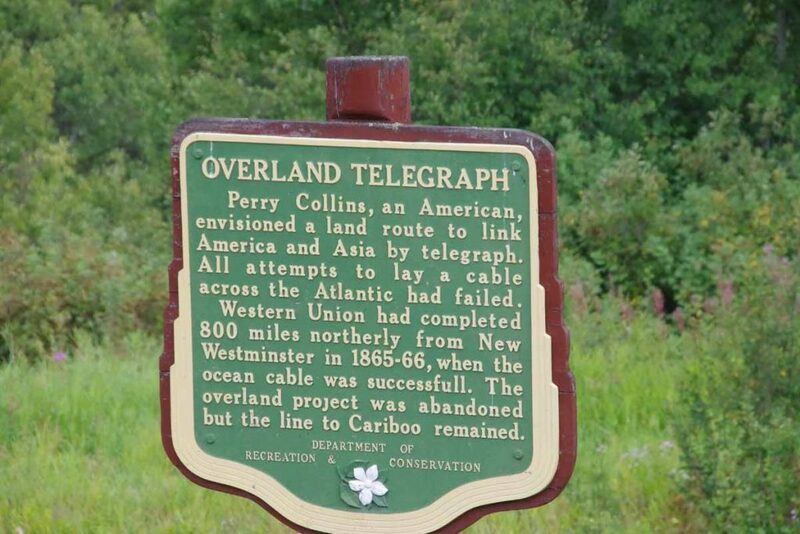 Also not too far from Telwaka was a rest area that had some signs including this one about an overland telegraph. It surprised me that bridging the Pacific would somehow be seen as easier than bridging the Atlantic. However, also gave good idea of importance of telegraph lines a little over a century ago – perhaps equivalent of “fiber” today. Close to 25km it began to rain for a while. The road also had a few hills to climb over. Fortunately, it was mostly done by 35km when I caught this cyclist coming down the hill. He was headed to Juneau. I asked about hills and he indicated the one he had come down was the largest. Shortly thereafter was a somewhat steep ~3km and then flatter ~5km to reach top of Hungry Hill. 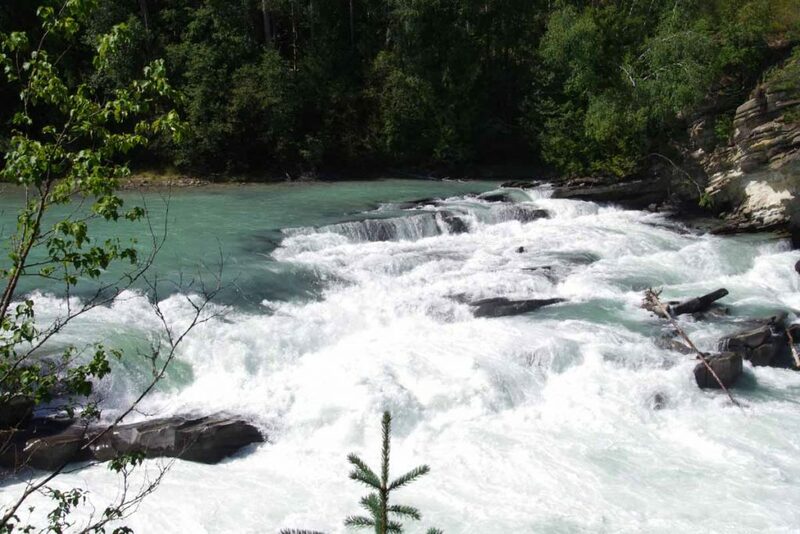 After climbing the hill a good descent back to the Bulkley River and I was nearing Houston. The road shoulder had some more debris, particularly rocks and parts of logs – but was mostly still rideable. Without too much difficulty made it to Houston for lunch. 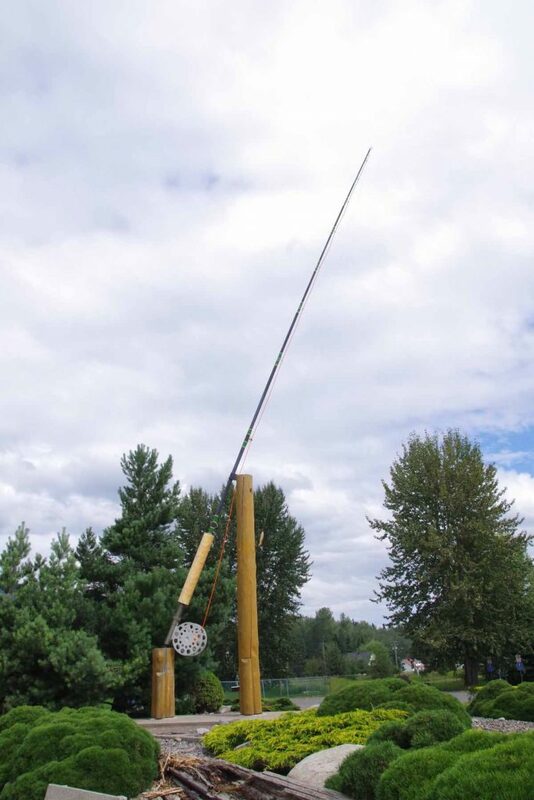 A claim to fame for Houston is the “World’s largest fly rod” as shown here outside the visitor center. The power was out so one restaurant was closed but Subway was able to make sandwiches. Had a sandwich and took a leisurely lunch before getting back on the road. 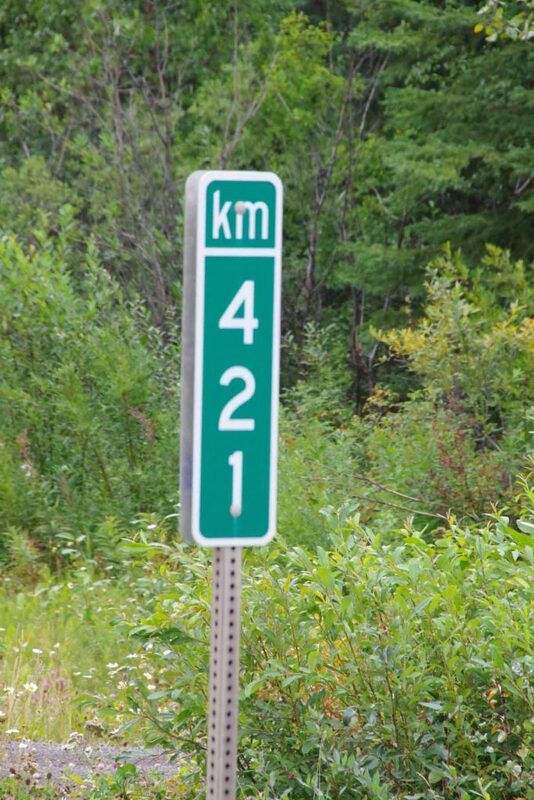 Passed kilometer post 420 (no sign) and then 421 (sign), on a road that normally places signs every 5km. The last 30km was mostly flat with a slight uphill grade as the road followed the drainage uphill. 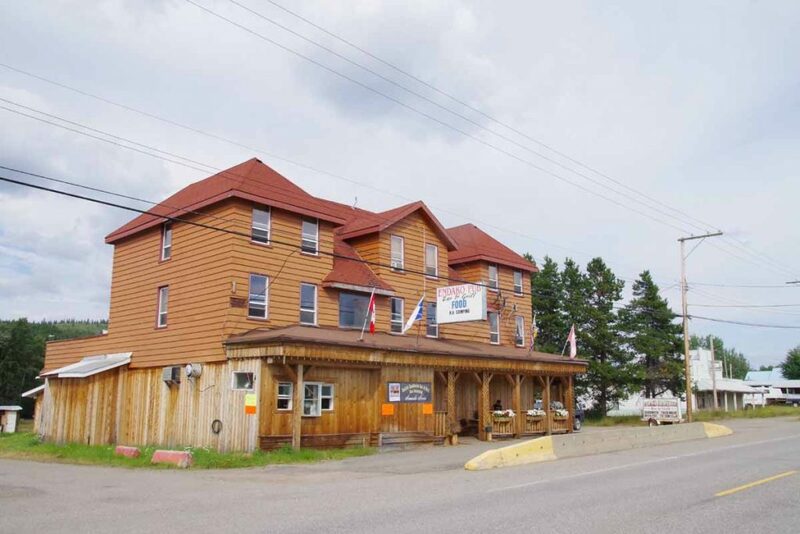 At 93km was turnoff to Granisle and a store, motel and closed restaurant. I didn’t expect much in next 50km until Burns Lake so figured it was good place to stop for the day.